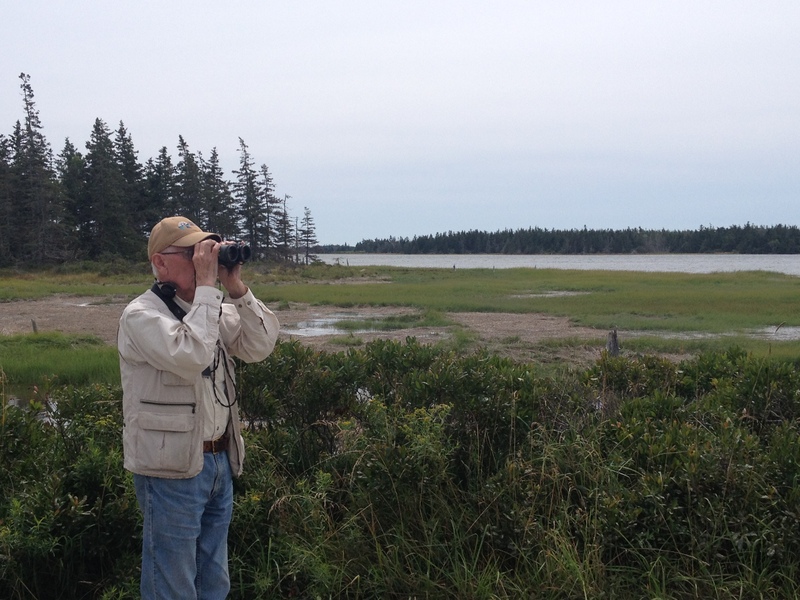 2017 Monhegan Fall Migration Weekend Tour Report. Yellow-bellied Sapsucker, one of the more common and conspicuous migrants all weekend. 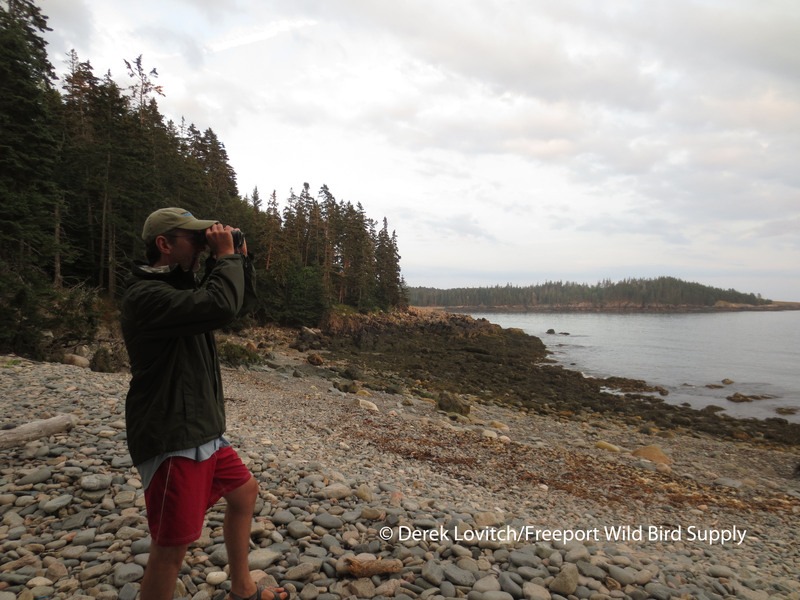 After spending what was probably the slowest week of birding I have ever experienced in fall on Monhegan with my WINGS tour a week prior, I was even more anxious to get back to the island. 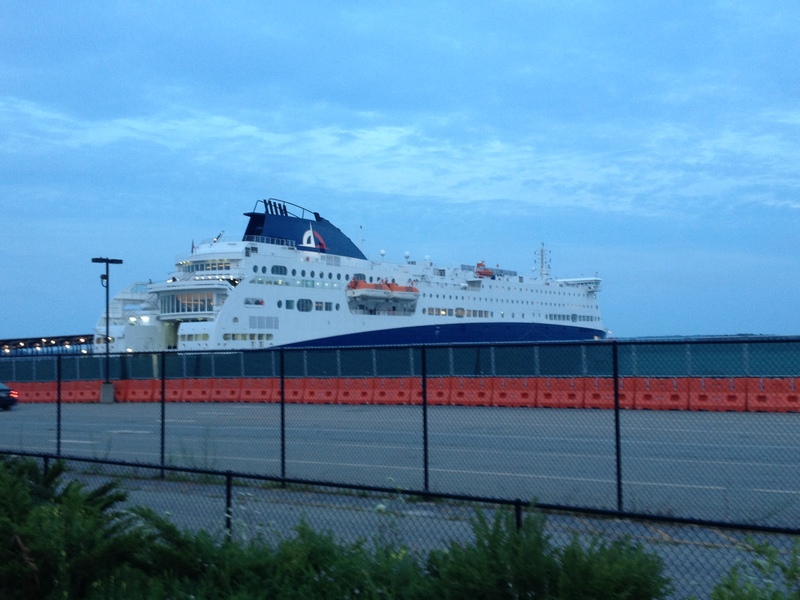 I know what this island can offer (well, besides great food, beer, and friends, that is)! 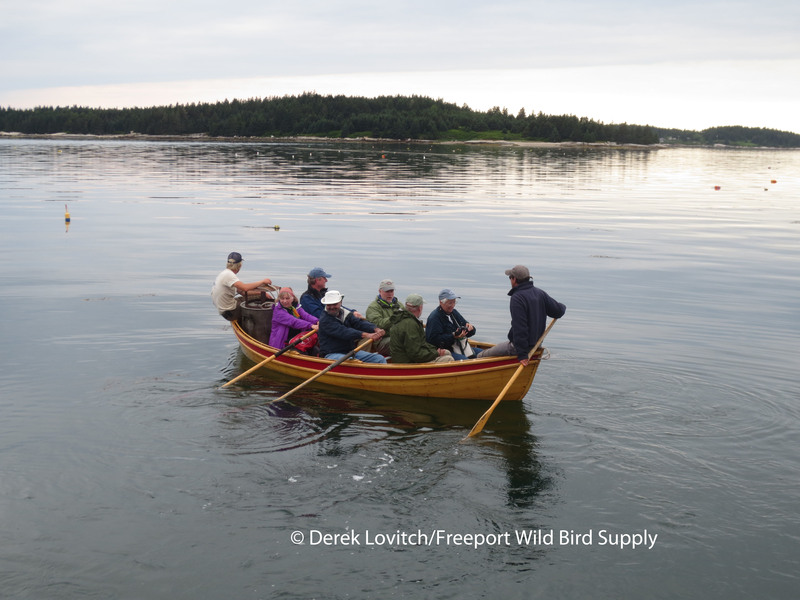 Because of ferry schedules, we added a new wrinkle this year, meeting for a birdwalk in Port Clyde before the mid-am ferry to the island (9/29). Golden-crowned Kinglets were particularly abundant and some Yellow-rumped Warblers were around, hinting at the amount of birds that arrived overnight. 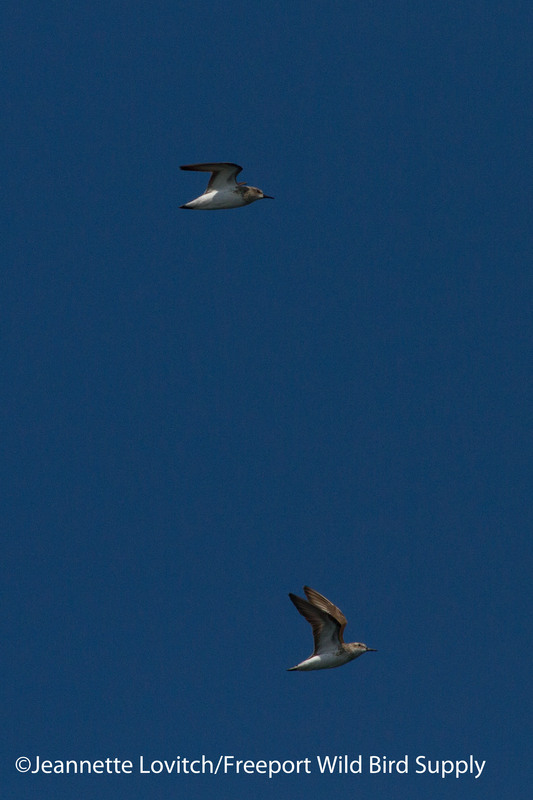 On the trip out, Northern Gannets were scattered about, and a flock of 7 probable American Pipits zipped by. 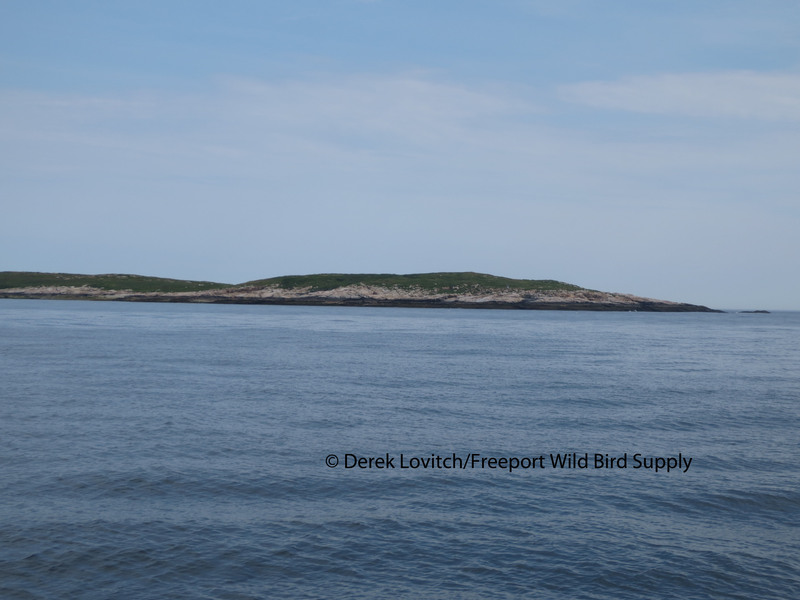 When passerines are encountered on the ferry, as they return to the mainland, it’s usually a good sign that there are a lot of newly-arrived birds on the island. When several Yellow-rumped Warblers were darting around near the dock, I thought it might be worth swinging into The Barnacle for a quick, early lunch so we could hit the ground running. And we are all glad we did, as it took us 2 ½ hours to walk from the dock to our lodging at the Trailing Yew! It was fantastic…birds were everywhere. While it wasn’t a fallout with birds dripping out of the trees, every cluster of trees and bushes had some migrants in it. The “Cape May Spruces” on dock road hosted several Cape May Warblers and an immature male Pine Warbler – a rarity on the island. We soon tracked down a continuing Orange-crowned Warbler, and we slowly made our way through town, pausing at every apple tree and every weedy garden. A lot had changed in the 5 days between my visits, with many more sparrows, and a much greater percentage of Yellow-rumped Warblers and both Ruby- and Golden-crowned Kinglets. Overall warbler diversity was down, but Yellow-bellied Sapsuckers were everywhere! The raptor show wasn’t half-bad, either. I think I saw more birds today, even though we didn’t arrive until 11:30 than I did all week with my other tour! And 60 species by day’s end wasn’t too shabby either. 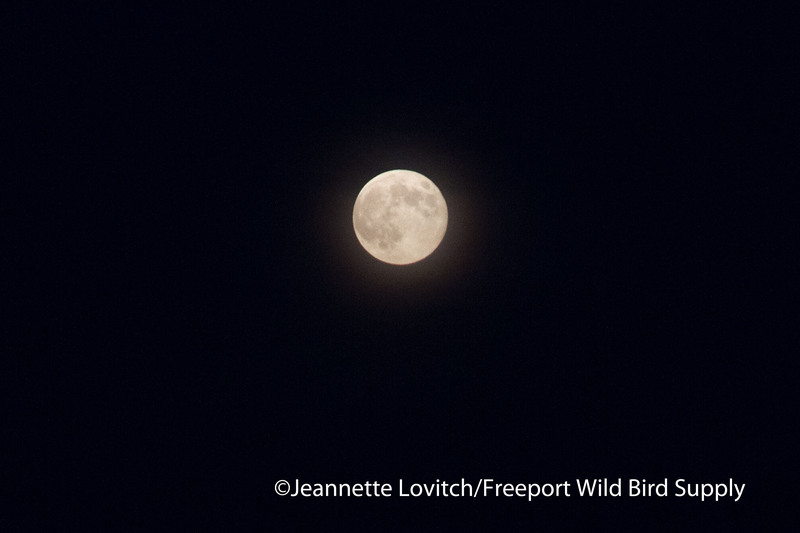 Friday night featured a very strong flight on the radar, but with a light winds becoming northeast after midnight, many fewer birds were around come morning (thanks to Hurricane Jose, this was the bane of our existence during the aforementioned tour), and the morning flight was very light. The afternoon was quite slow, but we continued to encounter new birds here and there. An unexpected surprise was a Wood Thrush calling at dusk. 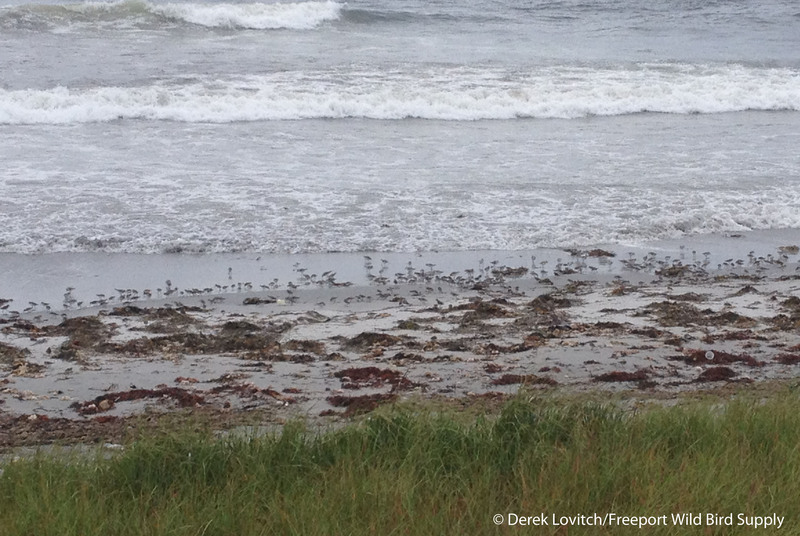 Although we never saw it, the calls are distinctive, and they were close by, and this was my 208th Monhegan bird (They’re usually long gone by the time I get here in mid-September). But this was only a fraction of the day’s excitement. First, a Bell’s Vireo was reported just as we arrived at breakfast. I thought about skipping the meal (it’s really a good bird if I consider passing on a Trailing Yew breakfast!) but after hearing about how chaotic it was (lots of owl calls and counter-productive tape use – tell me why a bird, exhausted from migration and without any hormonal urge to breed would come out in the open because you are playing an adult male’s territorial song? Especially when vagrants are often immature birds, the last thing they are looking for is a conflict; it’s amazingly ignorant…but I digress) down there, we decided to let the masses subside and fuel up for the hunt. By the time we arrived, almost everyone had dispersed, and no sign of a Bell’s Vireo. But Pumphouse Road and the nearby yards were birdy, so we just started working the thickets. We had dispersed up and down Pumphouse Road, joined by several friends and fellow birders, including Kristen Lindquist and Bill Thompson. I was with just two members of our group, when a small flock of five or so vireos came in. There were three Red-eyed, but then I spotted what I thought could have been the Bell’s -a very pale, dull vireo creeping around the understory, with its tail cocked. With no one else around, I took off to assemble the group, and to get Bill to secure the documentation photos. When guiding, a bird doesn’t count unless the group is with you, so before I had anything definitive, I started running (only then remembering my ankle was still in a brace)! Barb and Terez were still on what she thought was the bird in question, but as we all returned, it was clearly just a normally-pale, immature Blue-headed. Did I screw this up that badly? But wait, where was that 5th vireo? I don’t remember who spotted it next, but when we did, it was clear it was not a Bell’s, but wow, that was pale. Like really, really, pale, and as we began studying it, we realized this may be even rarer! At one point, I made eye contact with Marshall Iliff, and we both kinda smiled and nodded. We were on to something. Bill began to fire away. We watched. And then we began to discuss. And discuss. And at the brewery later, discuss some more. And the next day, yup, we were still talking about this bird. Almost two weeks later, as well. This would be the first record for Maine, and one of very, very few records for all of the East Coast. 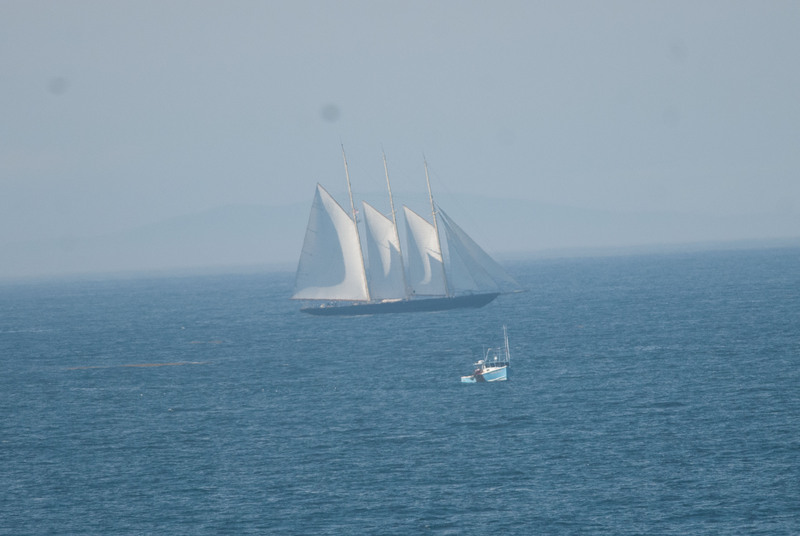 See, this is what a “slow” day on Monhegan should be like. Anyway, back to the actual birding on Sunday. 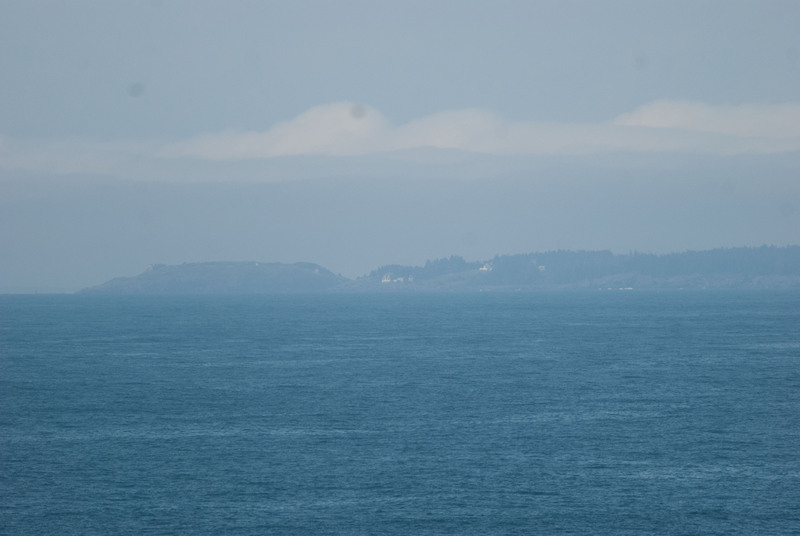 After only a surprisingly moderate flight overnight on light westerly winds, only a light morning flight was over the island, and it was almost exclusively Yellow-rumped Warblers. 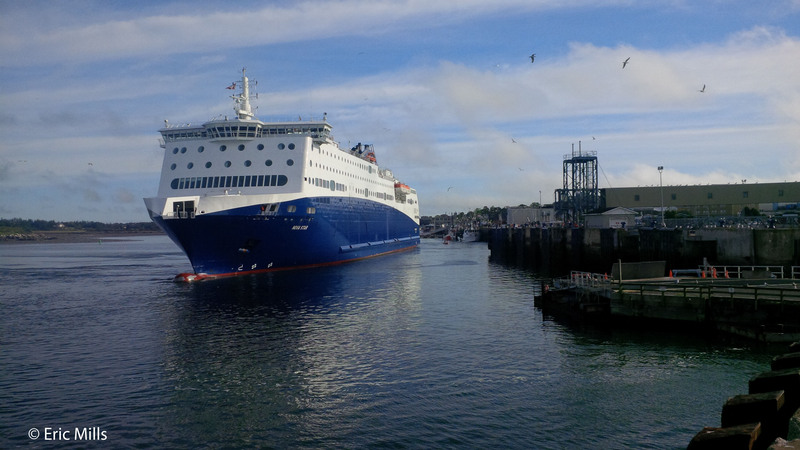 Increasing south winds helped keep activity reduced through the afternoon, when most of the group slowly departed on their respective ferries. We had great looks at the two continuing Dickcissels, more great views of Cape May Warblers, and finished the day off with the last member of the group by enjoying the long-staying Yellow-crowned Night-Heron at the Ice Pond. That chase and discussion of the vireo was exhausting! 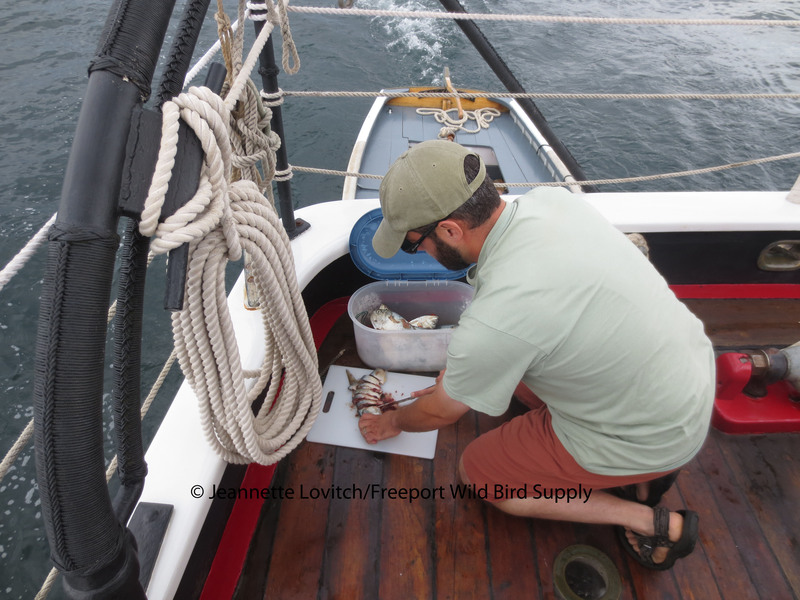 It was just me and group-holdover John Lorenc on Monday morning, when Jeannette joined us for the day on the early Port Clyde boat. Her visit during my WINGS tour yielded fog and little else, so she was anxious to see and photograph some birds! Interestingly enough, despite a rather light flight on the radar overnight (which really surprised me) on a light northwesterly wind, a strong morning flight developed come sunrise. As expected by the date, it was mostly Yellow-rumped Warblers, but there were many more kinglets and sparrows around. It was very busy before breakfast, and quite birdy – if rather homogenous – through lunch, with “new” birds scattered about. Even the early afternoon was pleasantly birdy, with pockets of activity here and there. At least 4 Dickcissels were now present, and likely a new Clay-colored Sparrow. 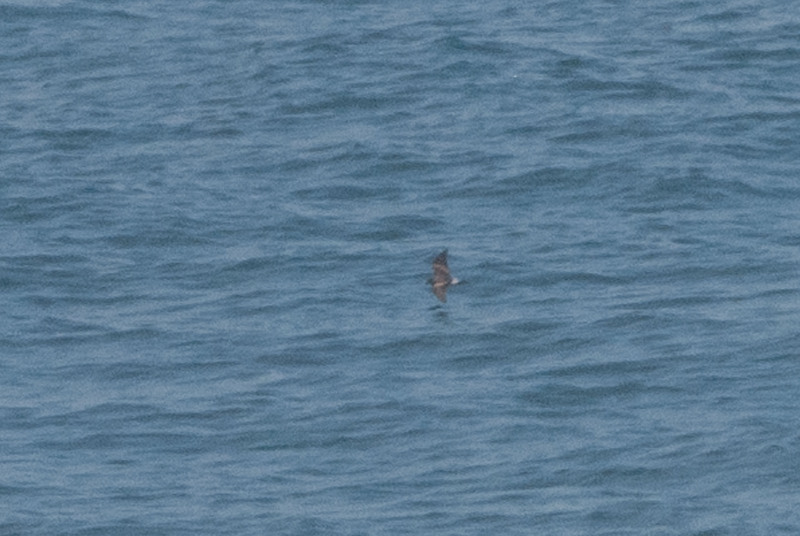 We had a fly-by of a Northern Pintail at Lobster Cove, one of very few records for the island. 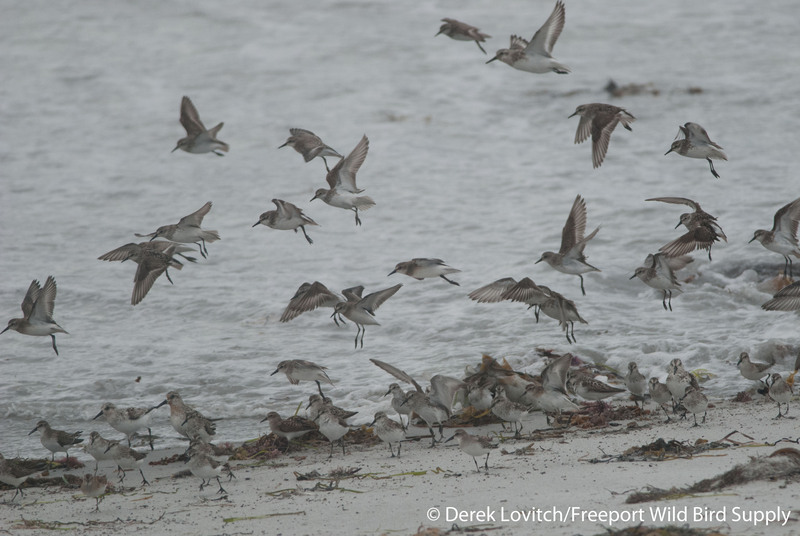 A calling Greater Yellowlegs, a flushed Wilson’s Snipe, and large flocks of southbound Canada Geese high overhead were among the additions to the weekend’s checklist. When all was said and done, and Cassin’s Vireo was (fairly) confidently added to the list, a total of 89 species (including 15 species of warblers) were recorded in these four days, a respectable if not overwhelming total for a long weekend on the island. 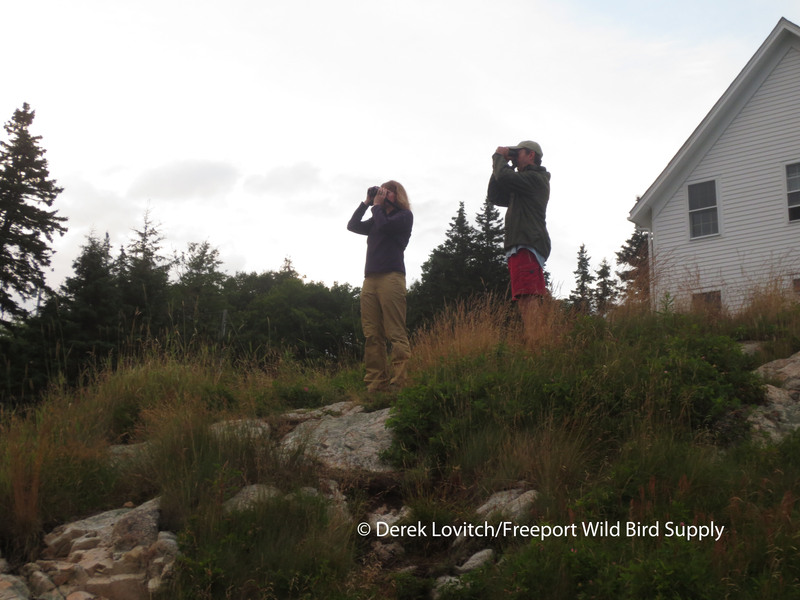 This entry was posted in Birding in Maine, Private Guiding and Tours and tagged "Birds, Birding, Black-throated Green Warbler, Cape May Warbler, Cassin's Vireo, Dickcissel, migration, Monarch, Monhegan, Monhegan Island, MonhegZen Fall Migration Weekend, Northern Gannet, Painted Lady, Red-eyed Vireo, Tours, trips, Yellow-bellied Sapsucker on October 12, 2017 by Derek. 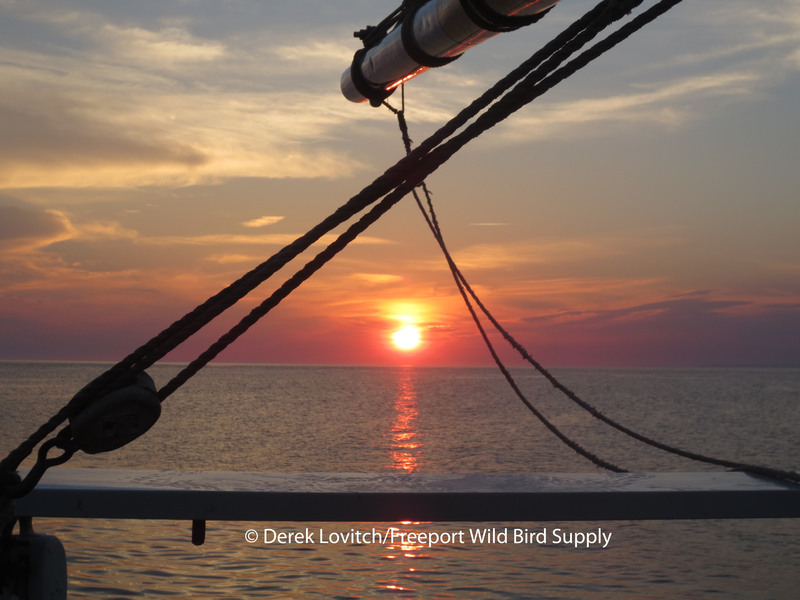 Jeannette and I were once again had the honor and pleasure to have the opportunity to be the guides on a 6-day birding tour aboard the Lewis R. French out of Camden, Maine. This was our third tour together (I also was aboard for a private charter last year), and we have been looking forward to this trip since the last time we stepped off the boat. While this blog entry will obviously focus on the birding and wildlife aspects of the trip, I will not be able to do this tour justice with words nor pictures. It is truly a unique experience from start to finish. 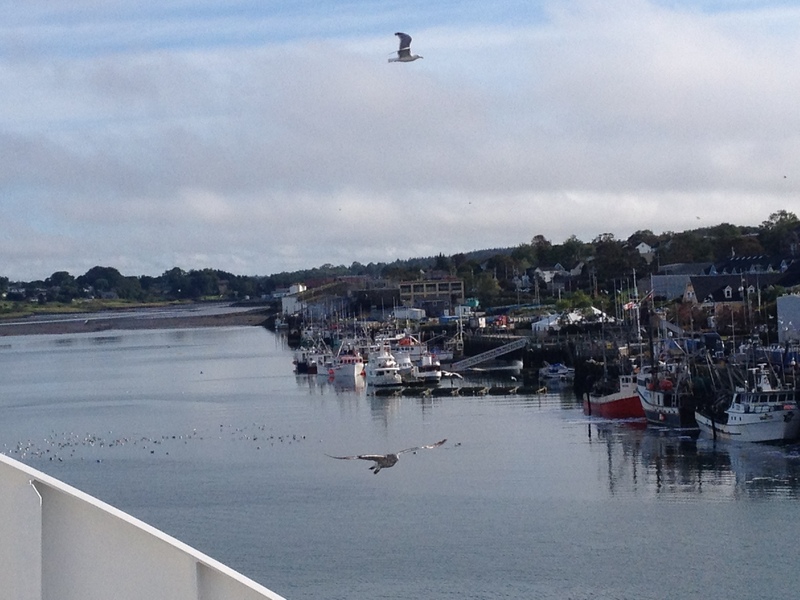 As we departed the harbor, we started our trip list with common species such as Mallards, Double-crested Cormorants, Laughing Gulls, and a smattering of landbirds. 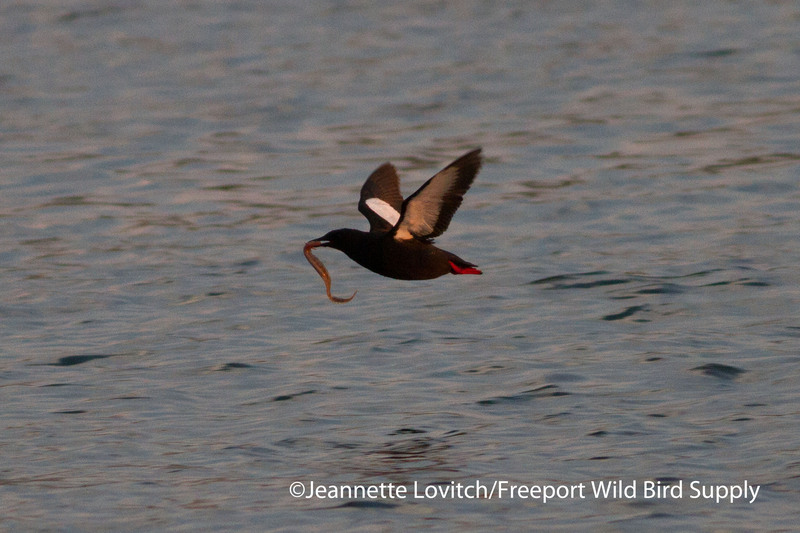 Osprey nests were passed and Black Guillemots were in their usual abundance. Common Eiders were common, as were Herring and Great Black-backed Gulls, along with a scattering of Common Loons and Common Terns. 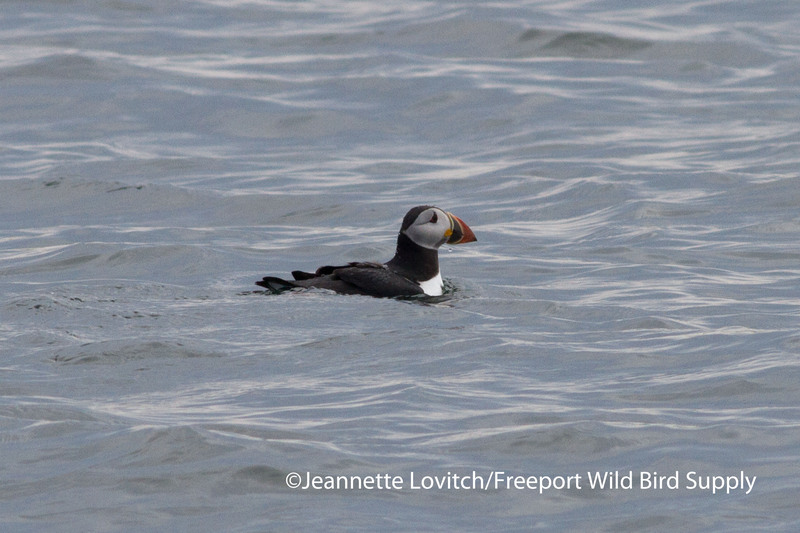 Many of these, especially the gulls, cormorants, eiders, and especially the guillemots would be constant companions throughout the trip, especially in in- and nearshore waters. Amanda serving lunch; all meals were, as usual, fantastic. Lunch was “simple:” soup, a salad, fresh baked bread, and desert. 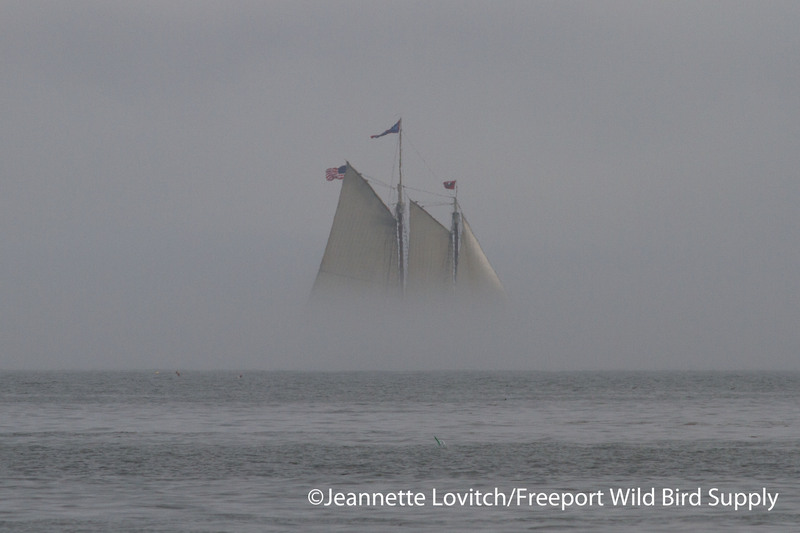 As we left the shelter of Penobscot Bay, the wind died off completely. 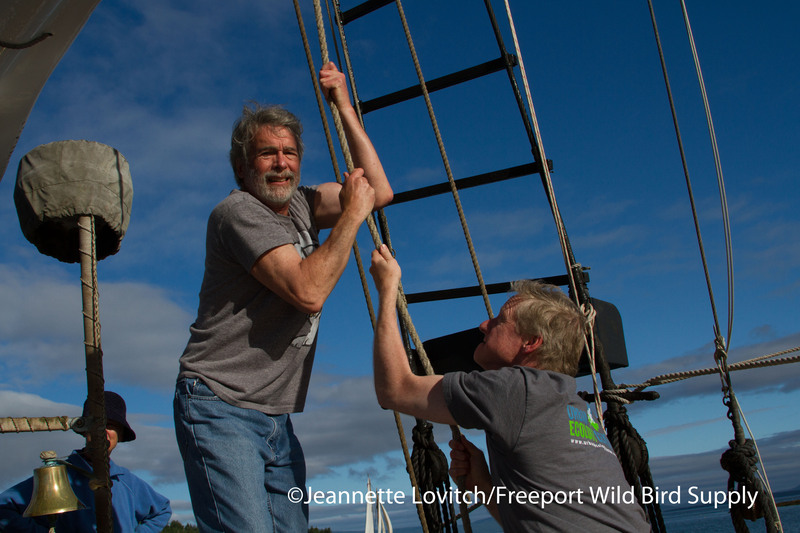 This would be the first of what was, unfortunately, a few days where we were forced to use our powered yawl boat to push the French along (Although we still use a tiny fraction of the gas as any other pelagic birding trip out there!). 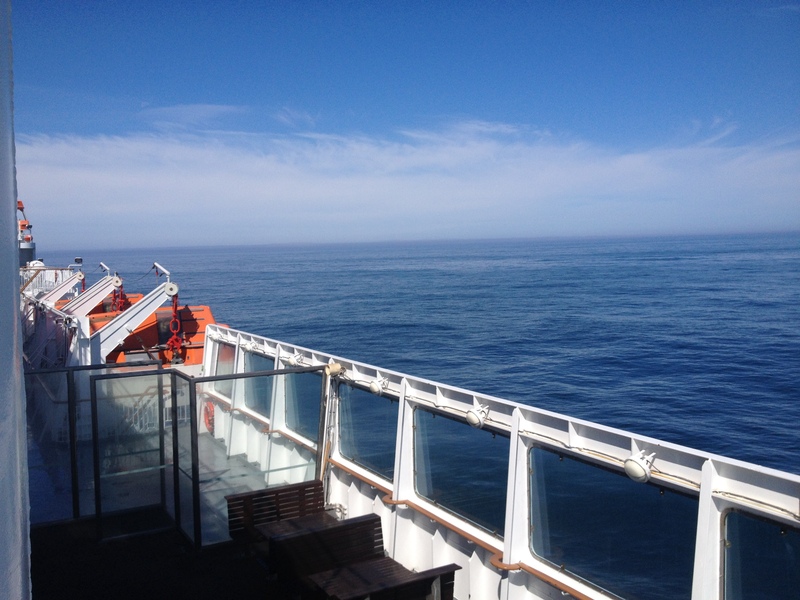 En route, we encountered a single Leach’s Storm-Petrel that provided a nice view, and a Manx Shearwater passed by – our first two target species spotted, and we hadn’t even reached Seal Island yet! 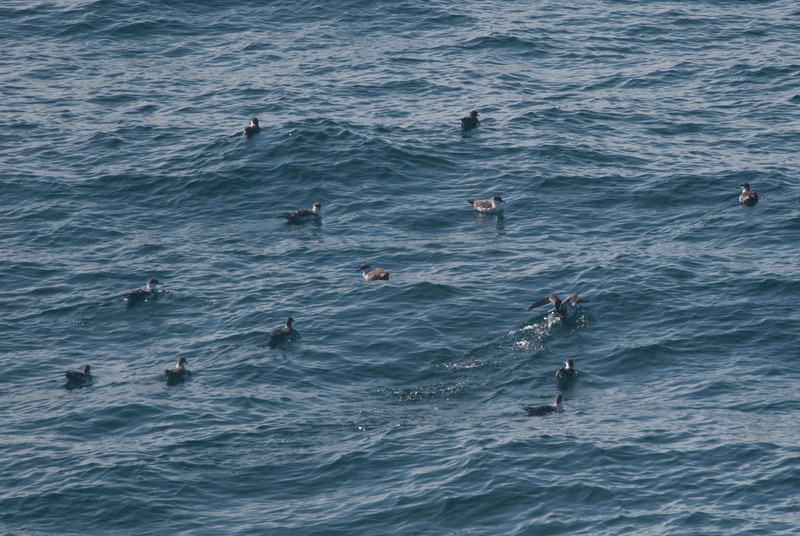 The waters around Seal were teeming with birds: lots’o’puffins, Razorbills, a handful of Common Murres, Great Cormorants, and a boat-load of Black Guillemots. 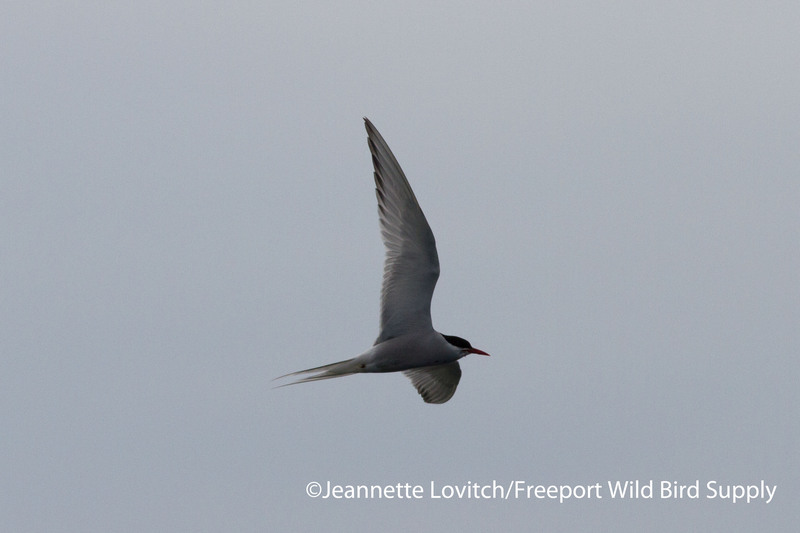 Hundreds of Arctic Terns were wheeling about the island, with many birds making close passes of the boat. 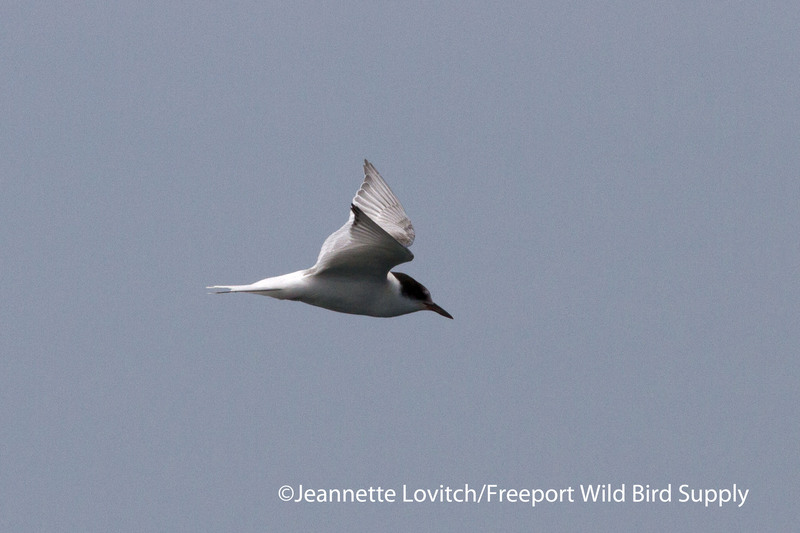 It did appear, however, that Common Terns had already mostly fledged, as we didn’t see too many. 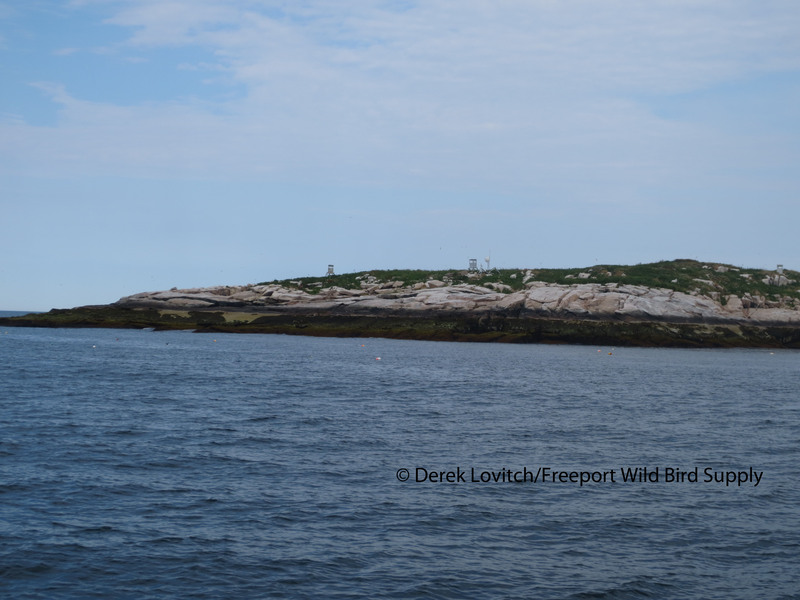 Three Common Ravens were a surprise, but Song and Savannah Sparrows singing from the island were expected. 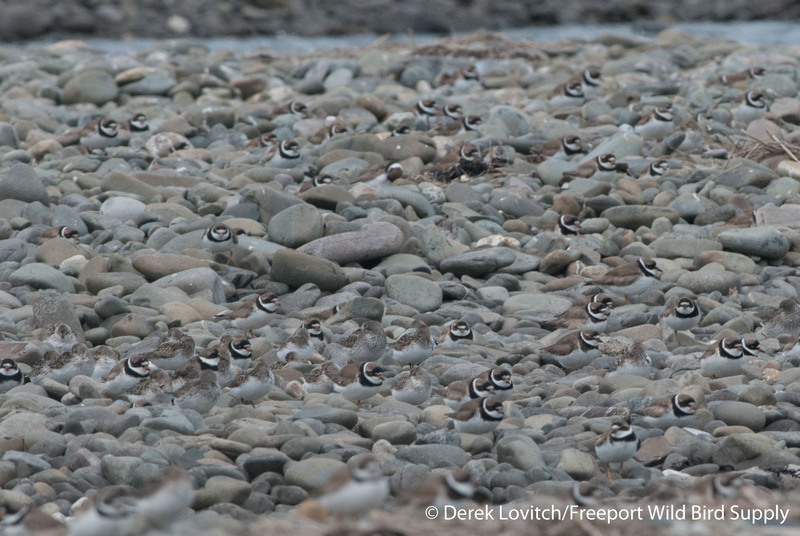 A few migrant shorebirds were darting about, including Least and Semipalmated Sandpipers, a few Ruddy Turnstones, and at least one Semipalmated Plover. 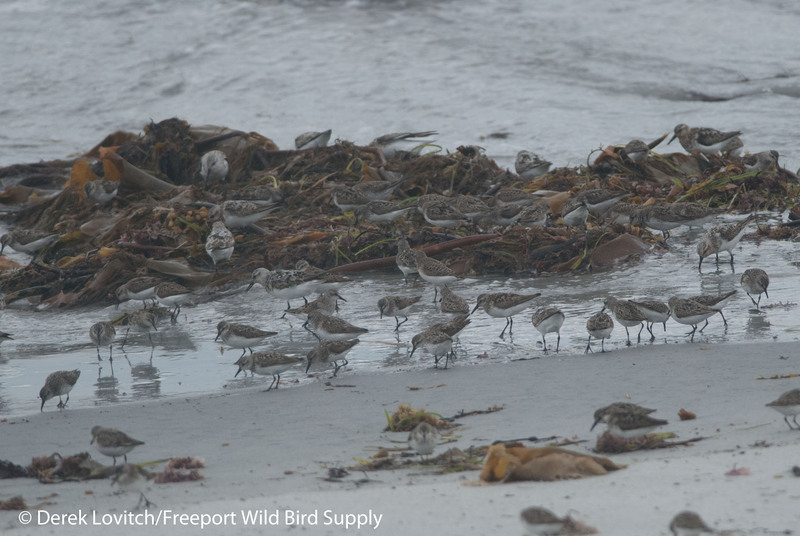 Spotted Sandpipers foraged along the shore, too, the only shorebird that breeds out here. 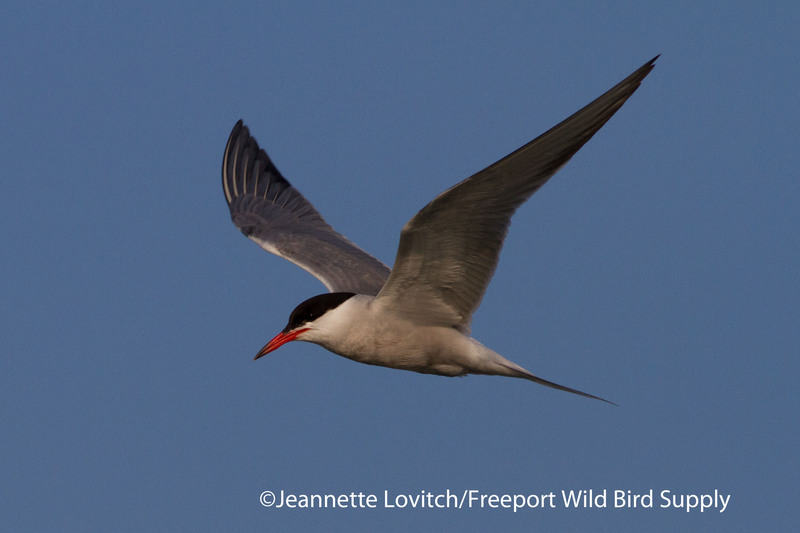 Unfortunately, the famous Red-billed Tropicbird did not put in an appearance. We were in position for his afternoon bath, but later we learned he often skips it when it isn’t sunny. “He’s a fair weather bather,” one of the biologists later told us. But our spirits were not dampened. After all, this is not a hard-core listing trip. 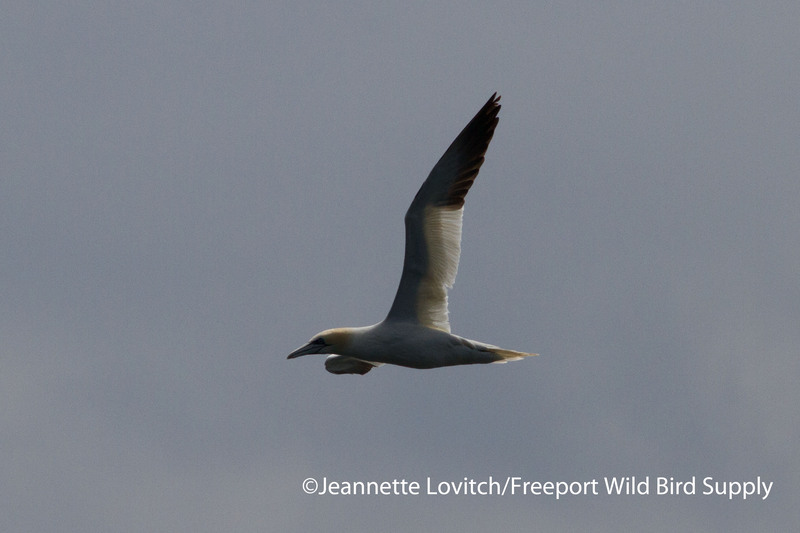 Although everyone would have liked to have seen the tropicbird, this tour is more about taking what the weather and the birds provide, and enjoying a relaxed, casual bird-watching experience. 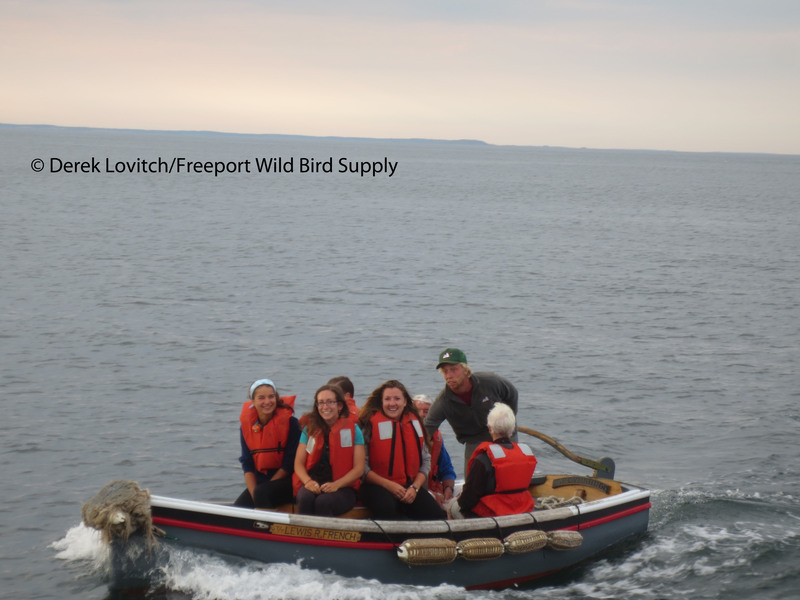 And just in case anyone was upset about dipping on the tropicbird, dinner was soon served – Amanda and Amber’s meals always put a smile on people’s faces – and we welcomed our special guests, the seabird biologists of SealIsland. 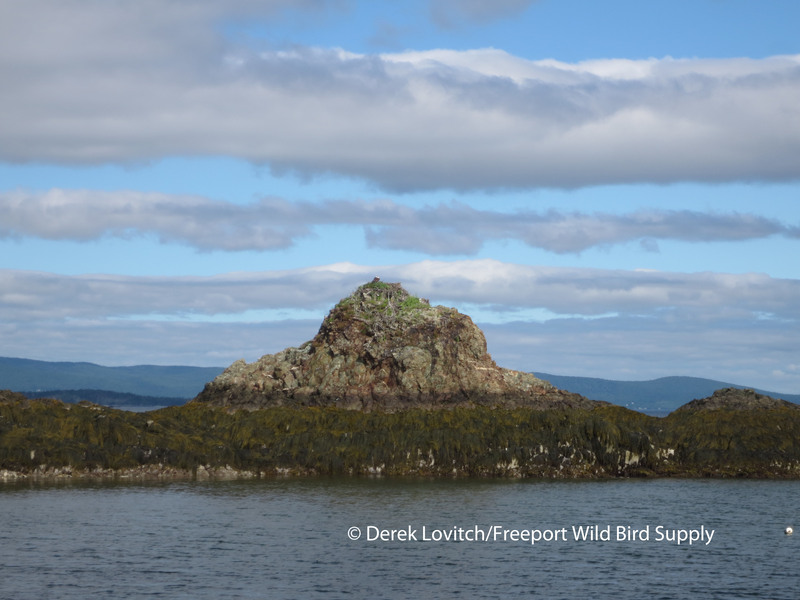 It’s a treat for us to ask them questions about life and birds on this remote rock, and no doubt a treat for them to get a brief break from the rigors of island life. 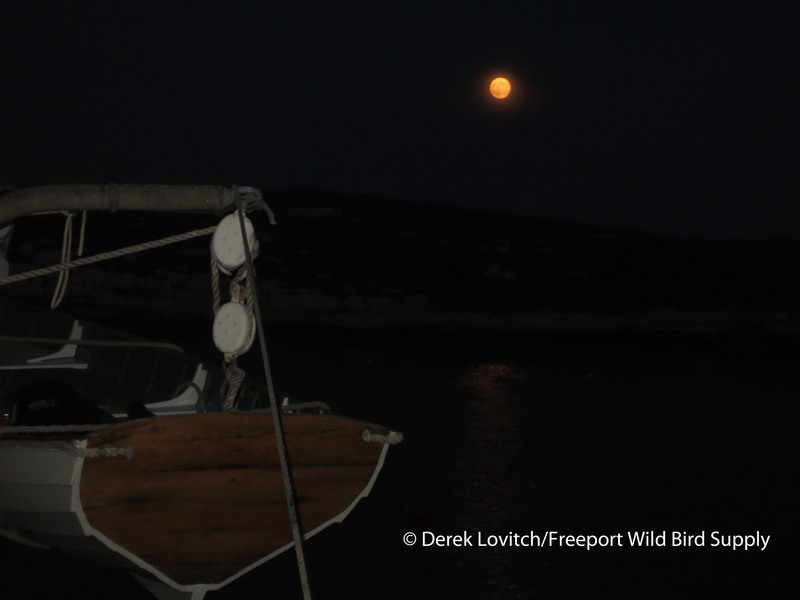 As night fell, and a near-full moon rose, many of the birders on board delayed retiring to their bunk until Leach’s Storm-Petrels – who only visit their burrow nests under the cover of night – began to vocalize. There were only three of us left on deck by 10:00, when I turned in. 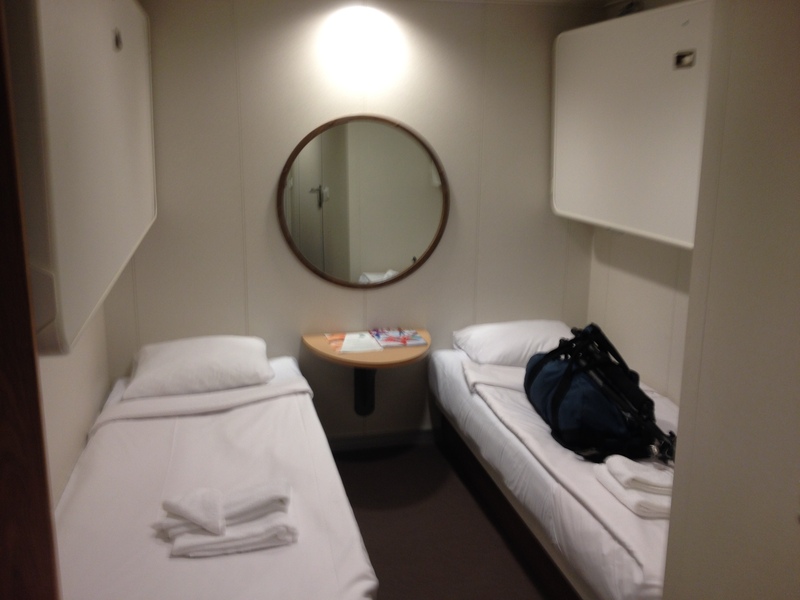 The one birder, our good friend Chris, however, stayed topside (and another birder slept on deck) for a while longer. 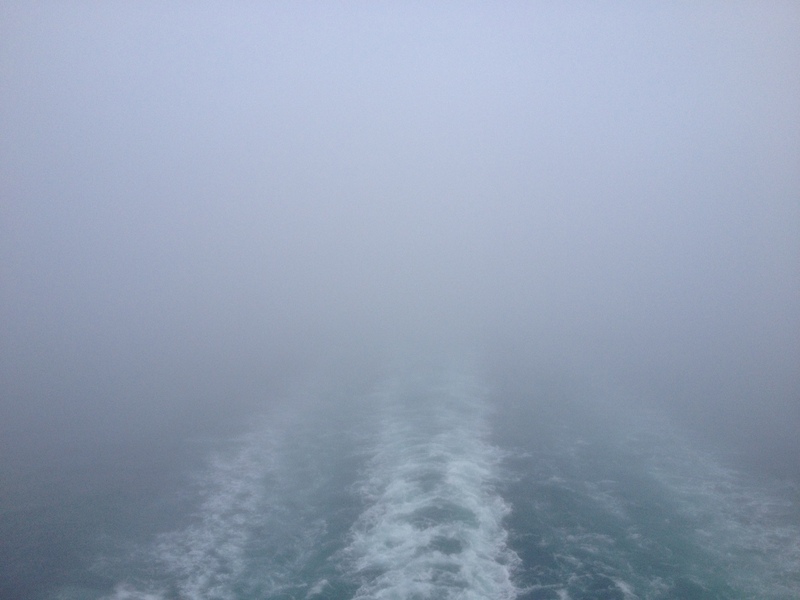 Not too long after I gave in to sleep, fog rolled in, and that really got the storm-petrels to call. Chris was rewarded for his stamina with a cacophony of somewhat-disconcerting cackling chatters. 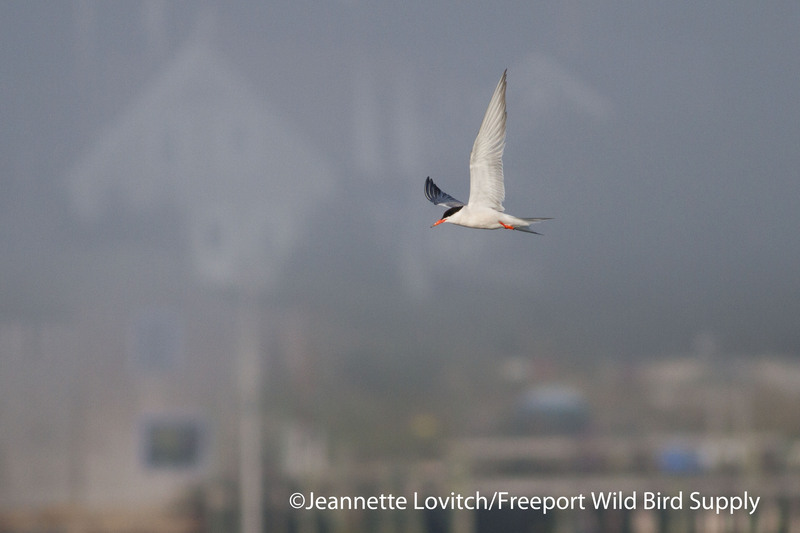 That fog was still around at sunrise, which unfortunately meant we would leave without the tropicbird. 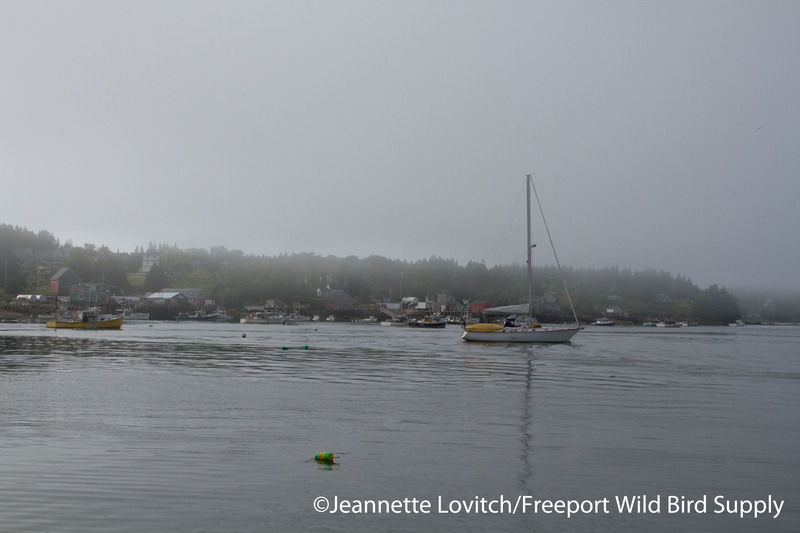 Even if he did come out for his morning bath, we wouldn’t have seen him – heck, we couldn’t even see his cove from the boat. 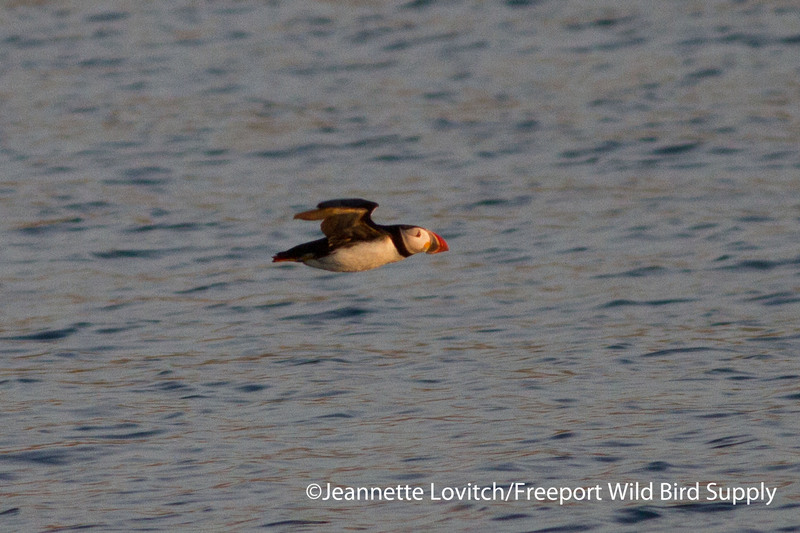 So we just had to suffer through more puffins. It’s a tough life. 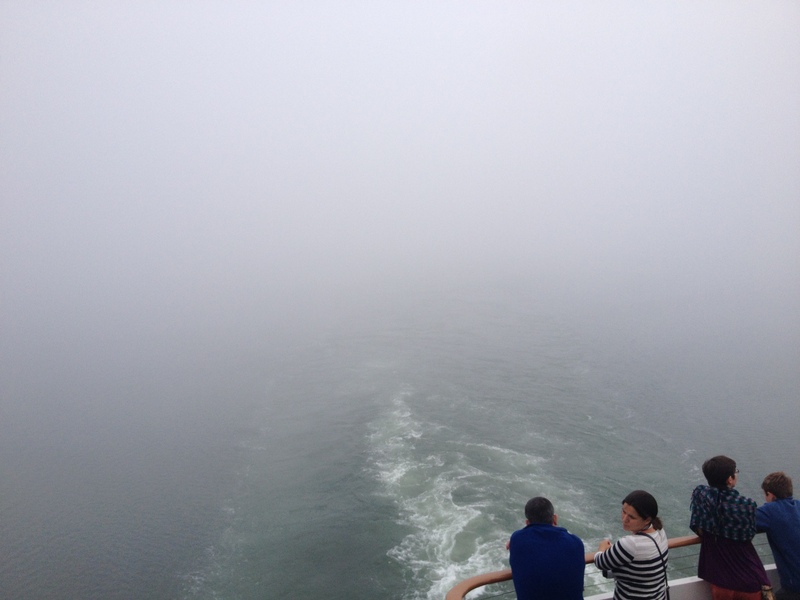 Fog and occasional rain reduced visibility as we headed for shelter inshore, but we spotted the occasional commuting puffin and a few Northern Gannets. 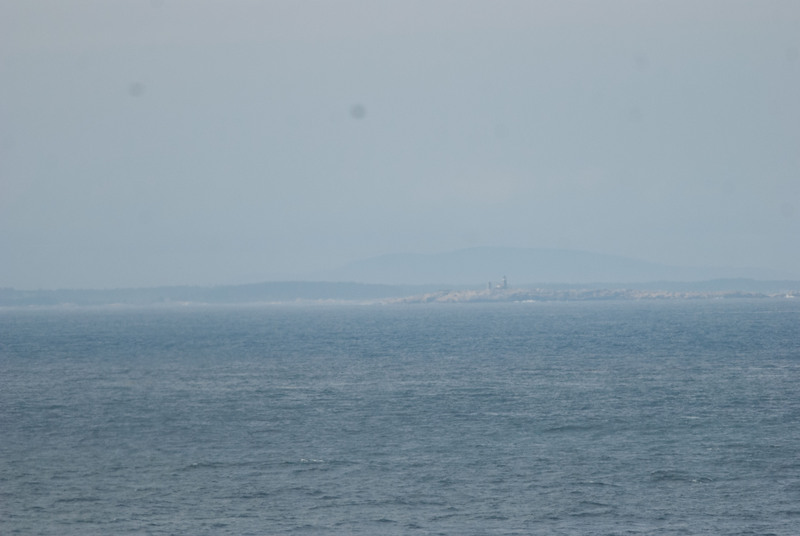 We passed around the west side of Vinalhaven Island, and dropped anchor off of North Haven in the Fox Islands Thorofare. An evening walk in “town” added landbirds to the list, including a few Purple Finches at a feeder and a Cooper’s Hawk. 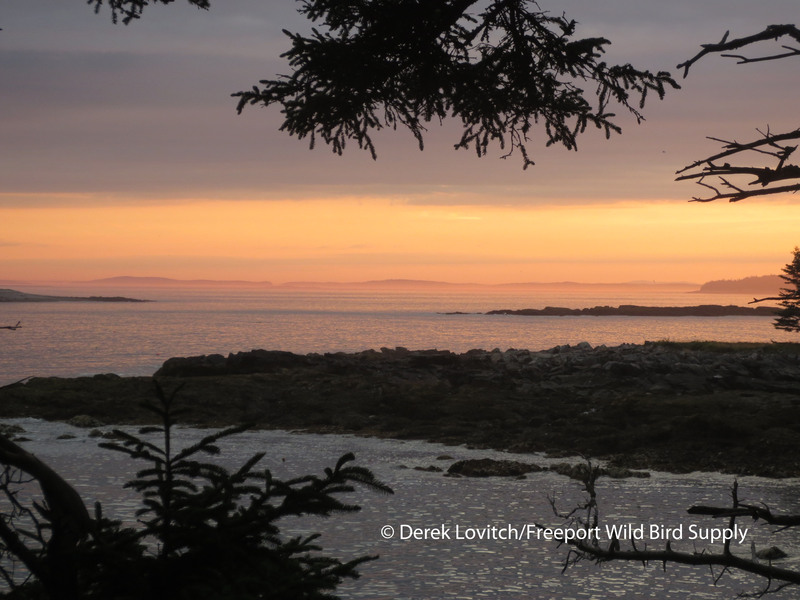 A Great-horned Owl called throughout much the night, and come dawn, we shuttled ashore for a birdwalk on Vinalhaven Island. Garth suggested a loop trail that was a short walk away from the dock, but we barely made it to the trailhead – the road in was just too birdy! 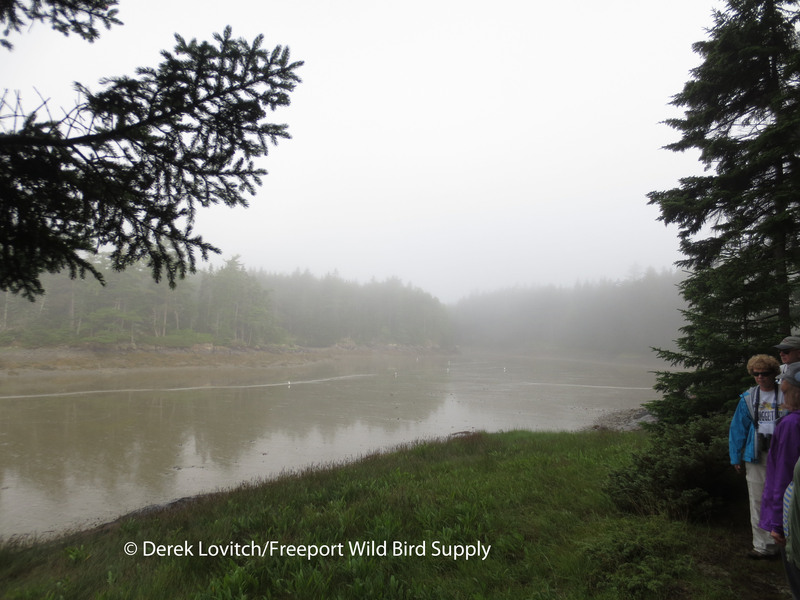 A Swainson’s Thrush foraged on the beach, a Blackburnian Warbler sang near the dock, and as we walked the road, we came across a variety of the common birds of these Red Spruce-dominated islands. Magnolia Warblers and Golden-crowned Kinglets; Winter Wrens and Dark-eyed Juncos. One little patch of alder scrub at the edge of a meadow exploded with birds with just a little pishing: two family groups of Black-throated Green Warblers, a pair or two of American Redstarts and Common Yellowthroats, a band of Golden-crowned Kinglets, White-throated Sparrows, and one Alder Flycatcher. 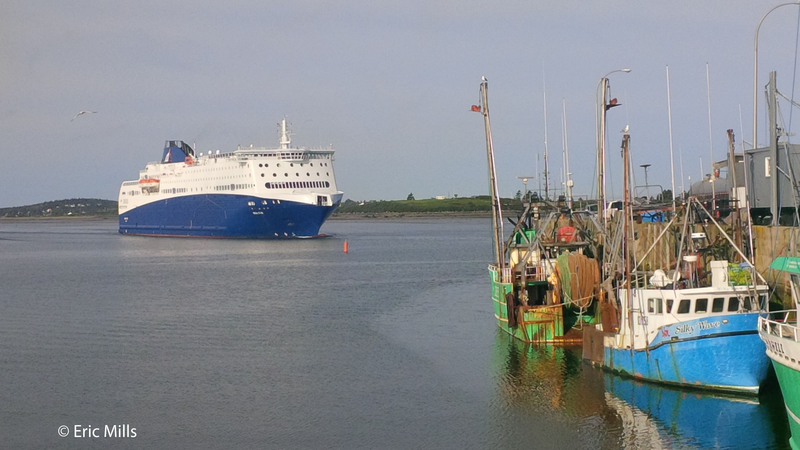 We had to hustle back to the boat in time for breakfast. 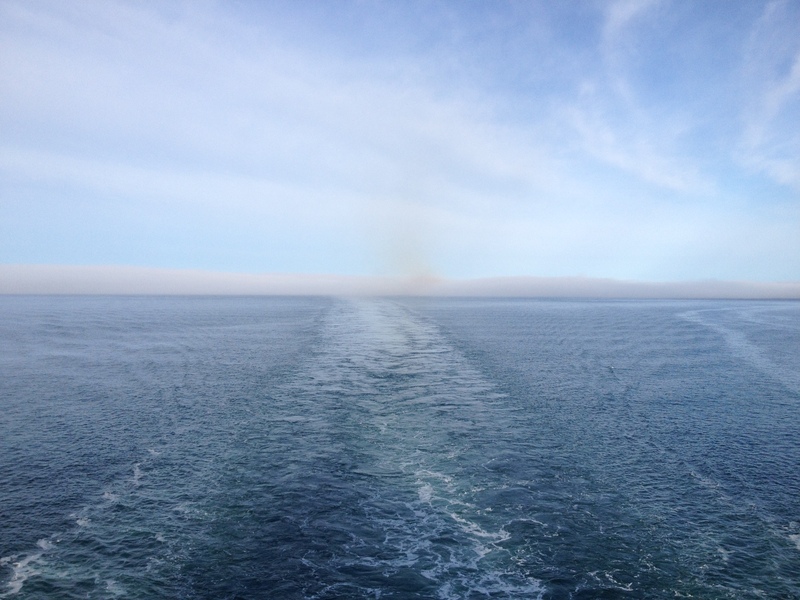 We rounded Vinalhaven clockwise, and came out of the fog for a time as we crossed East Penobscot Bay. We were back into the sun as we traversed Merchant’s Row, but once again we found ourselves without even a puff of wind. 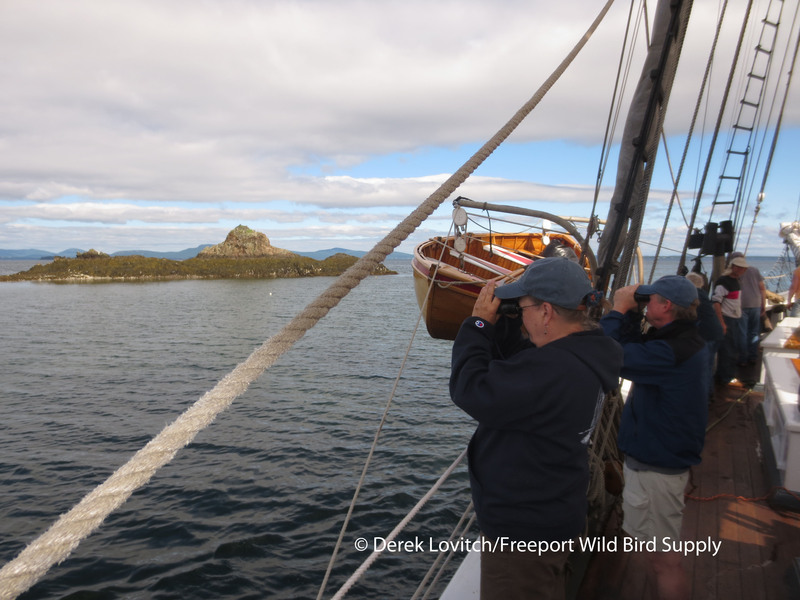 While an island with terns and alcids is usually the highlight of our sail, over the years, the colony of Herring and Great Black-backed Gulls and Double-crested Cormorants of Southern Mark Island has provided us with some entertainment. 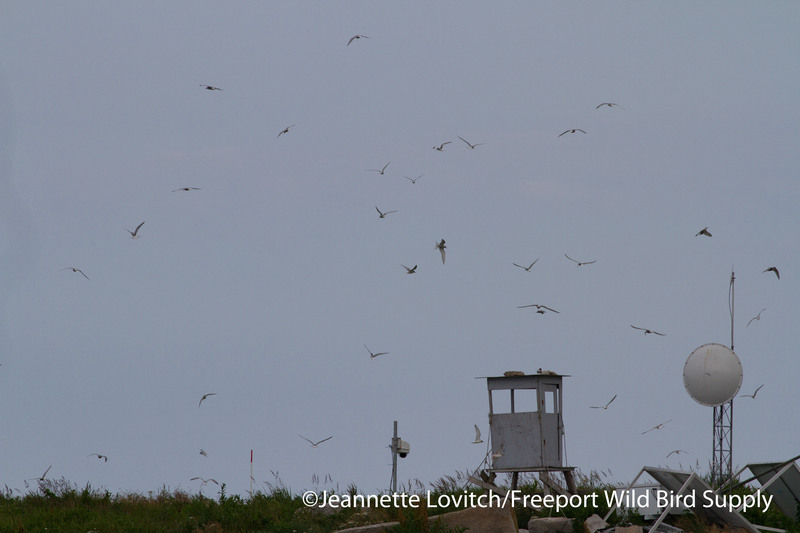 Here, Bald Eagles travel to hunt the colony, and in years past, we have seen some incredible shows. 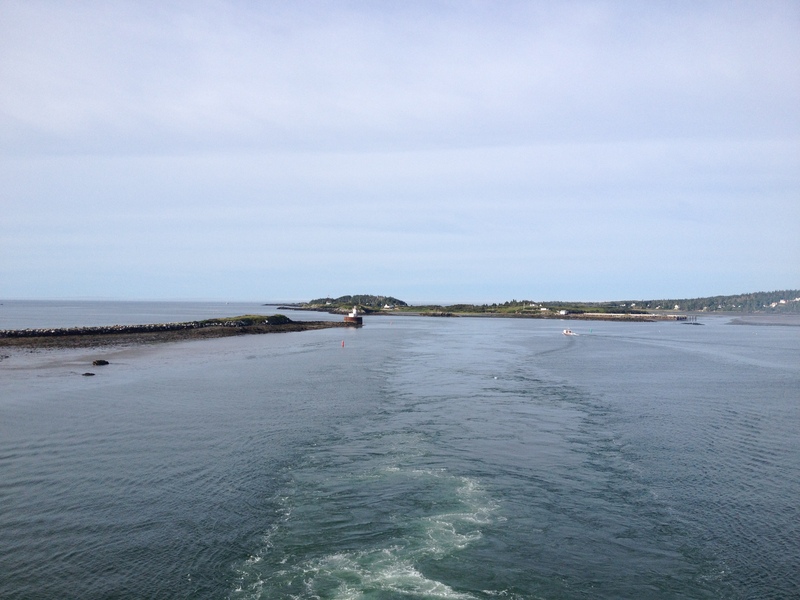 As we slowed down to view the island, two Bald Eagles rapidly approached right on cue. 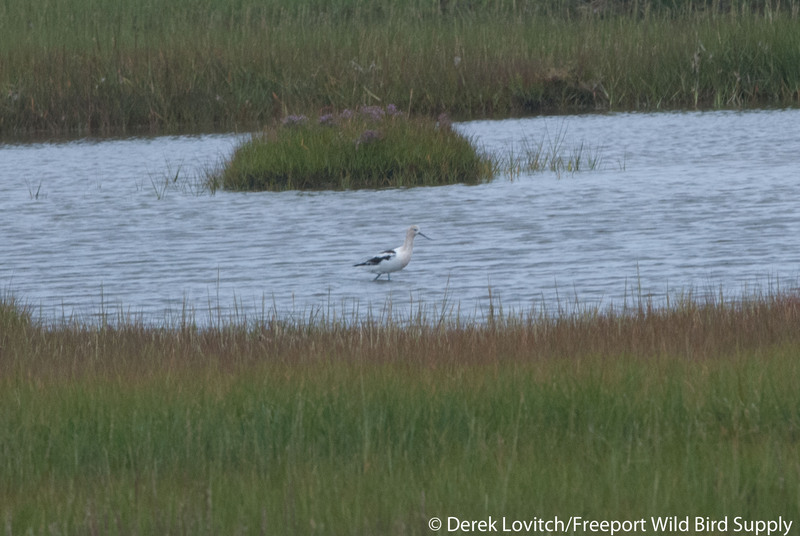 One landed in the center of the island, presumably to look for unattended gull chicks. This time, both eagles were driven off empty-taloned. Burnt Cove Harbor on Swan’s Island would be our harbor of refuge for the night, and an after-dinner dusk stroll in the village and out to the lighthouse added a couple more species to our growing list. 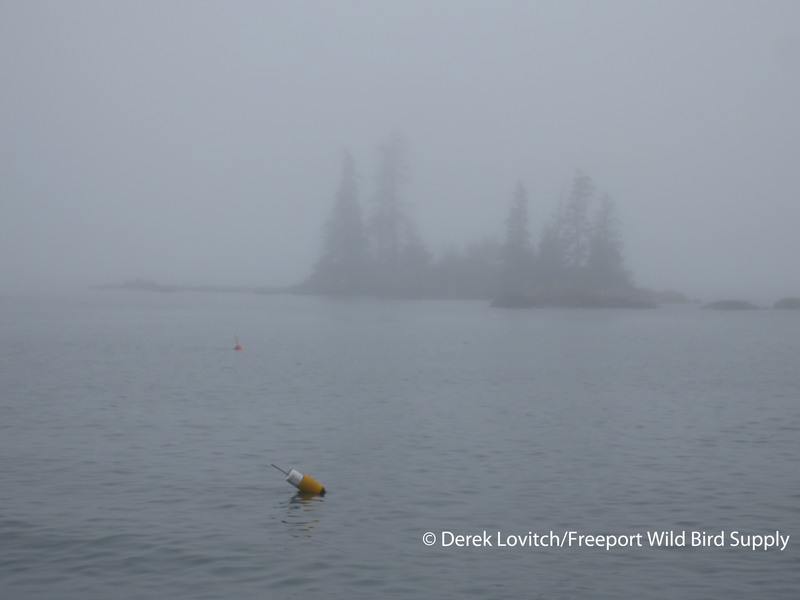 It was with anxious anticipation that I went to bed that night, as Garth had decided that – weather forecast holding true of course – we were going to head offshore yet again, perhaps all of the way out to Mount Desert Rock. 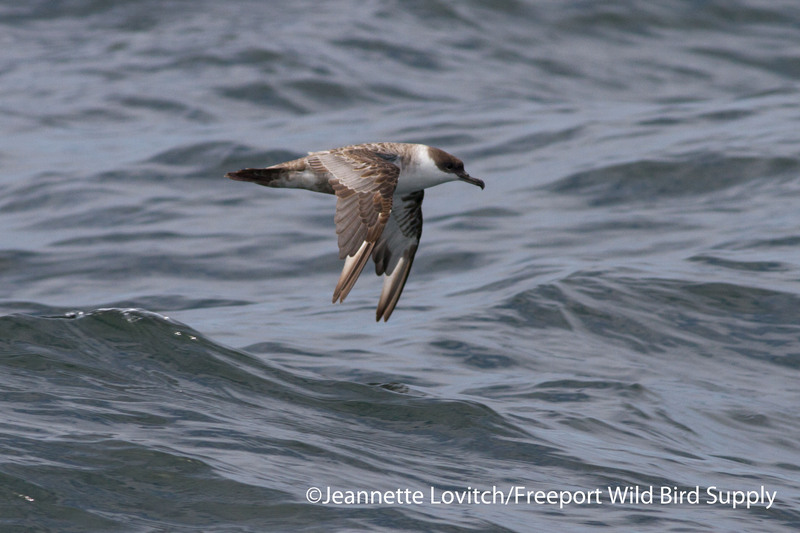 It was time for some true pelagic birding! And just to hedge the bet, we picked up some more bait for chumming. 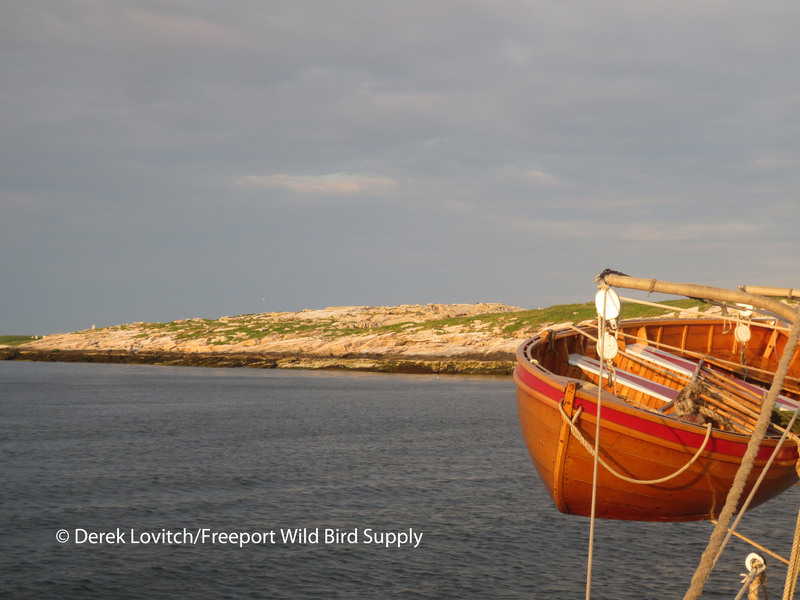 A light northeasterly wind helped us get offshore, but yet again, the wind died offshore and we needed the assistance of our yawl boat. 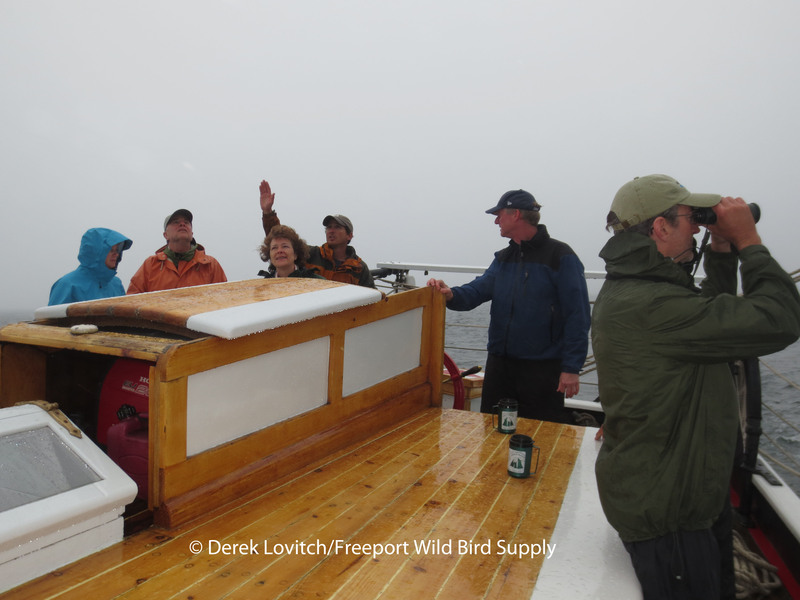 A very long 2-3 foot swell was hardly noticeable in our heavy wooden boat, and as we headed into deeper water, the birding really began to heat up. 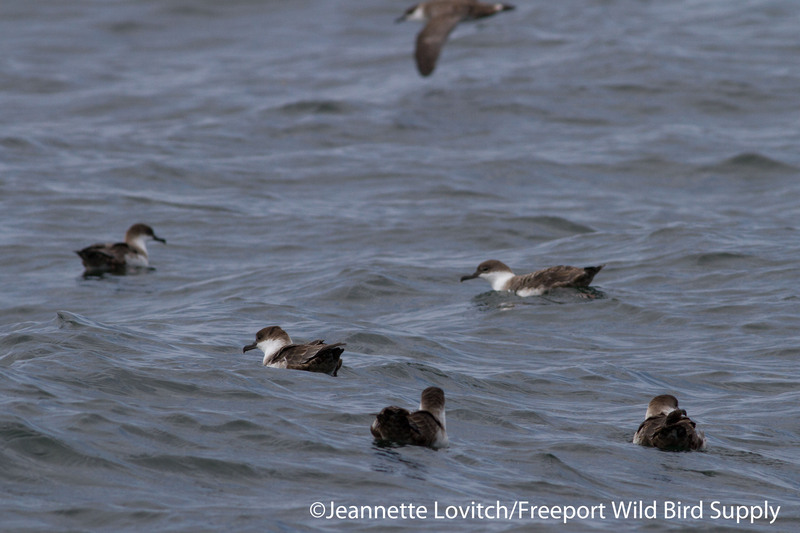 About a mile away from Mount Desert Rock, we hit pay dirt: massive rafts of Great Shearwaters. We sailed through them, and then back through them. 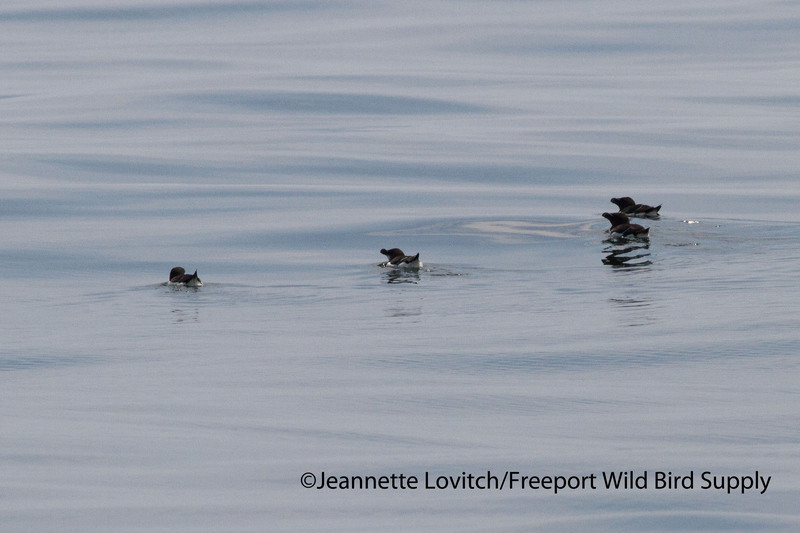 The lack of wind was keeping them on the water, and most just paddled away from our slow-moving ship. I began to chum. You could say it worked. It worked really, really well. 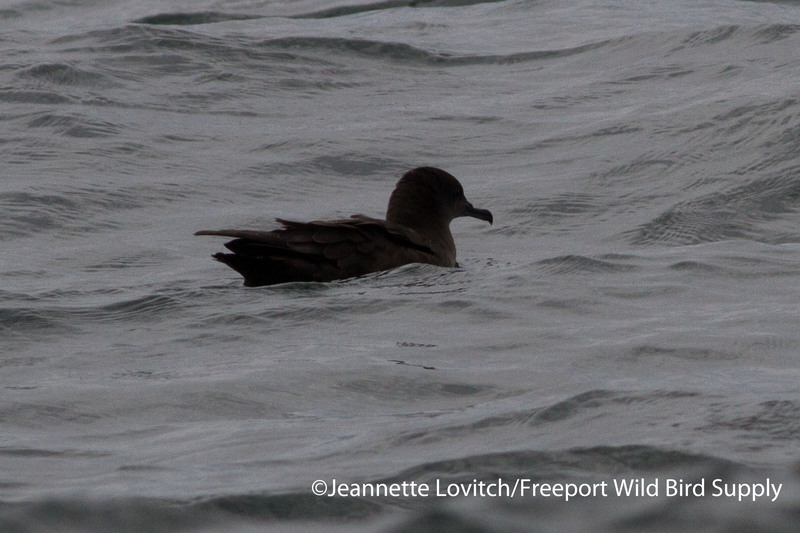 Great Shearwaters took the bait, literally, and followed us closely. 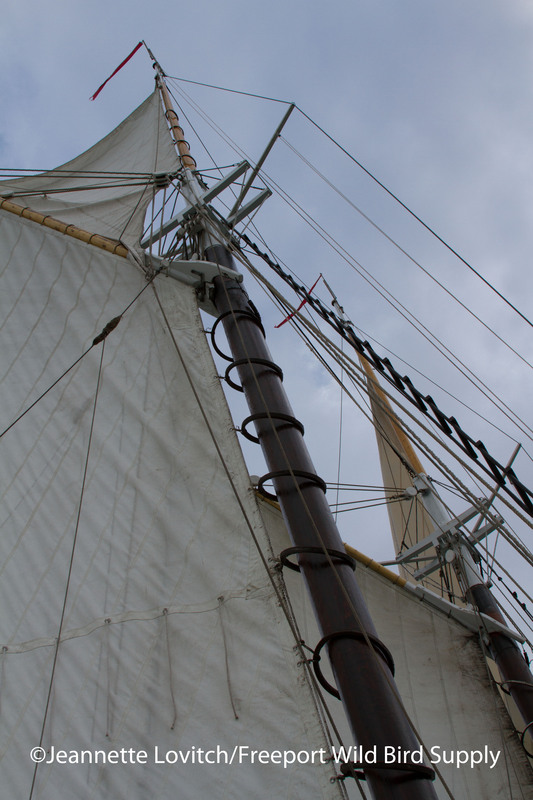 Now under sail, the silence afforded us the opportunity to hear these surprisingly-vociferous birds as they fought over morsels, and jockeyed for position. 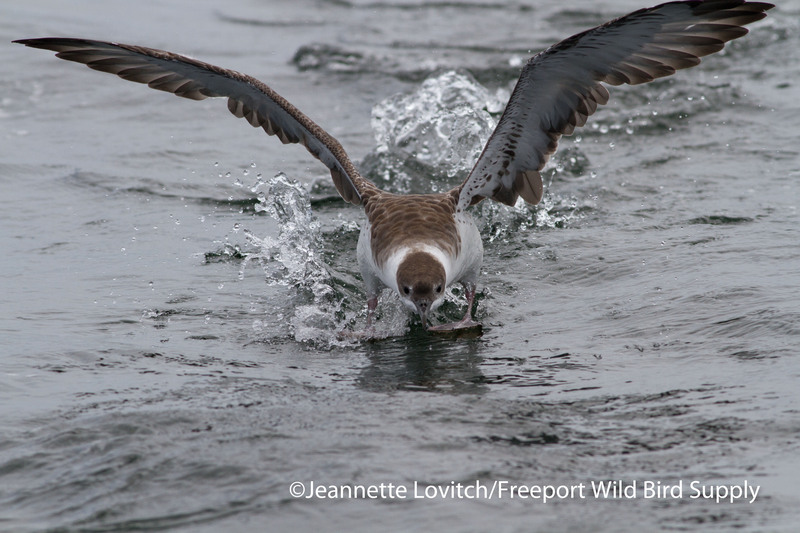 Many birds were coming within only a few yards of the boat, and many of them were not bothering to fly – just walking on water with wings flapping. They would plunge in after slowly-sinking chunks of Herring (I really wish I had cut things smaller, the chum bucket was going down way too fast!) and we were close enough to see them underwater. 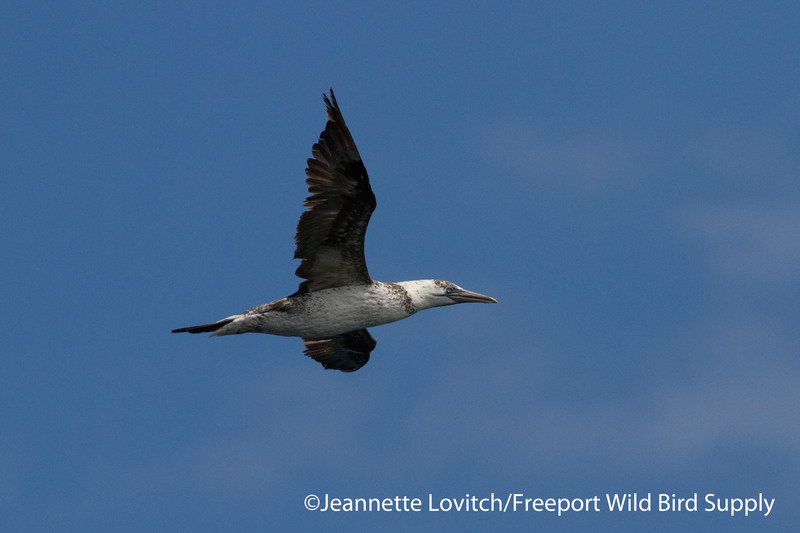 OK everyone, grab your copy of Howell’s ‘Petrels, Albatrosses & Storm-Petrels of North America and use molt patterns to age this Great Shearwater! 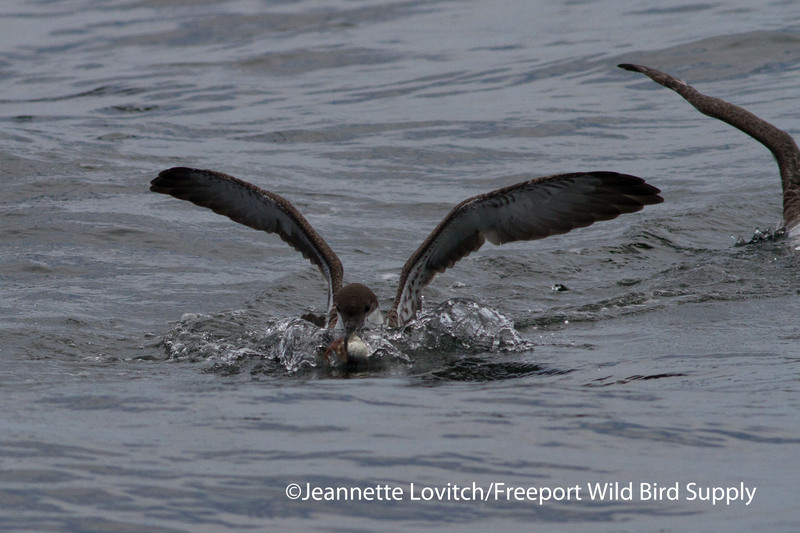 Great Shearwater coming in for a landing…I think this is my favorite photo of the trip! Simply put, this was a lot of fun. 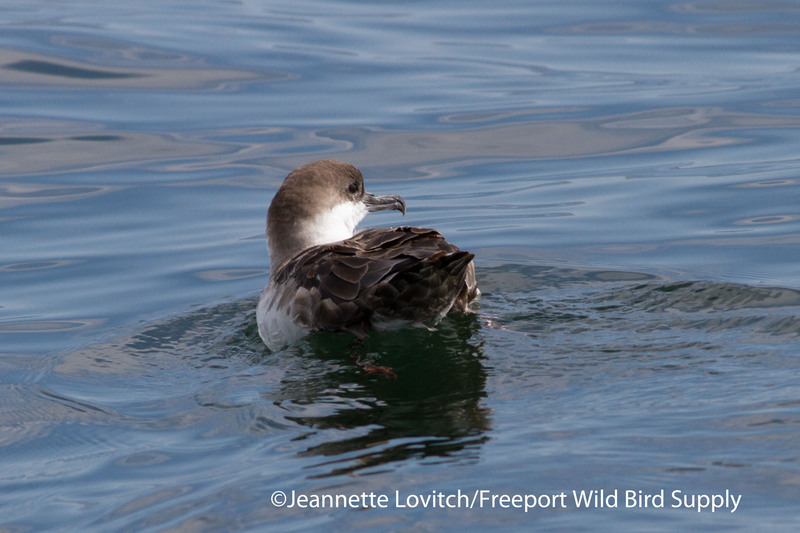 And when all was said and done, and we left the hotspot, we had tallied an impressive 764 Great Shearwaters. 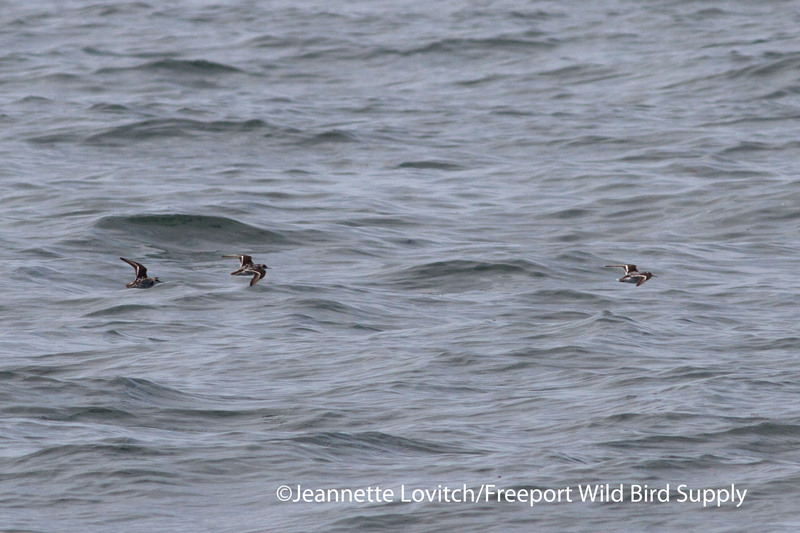 They were joined by at least 4 Sooty Shearwaters, and one Manx Shearwater cruised by – not pausing for long, as usual. 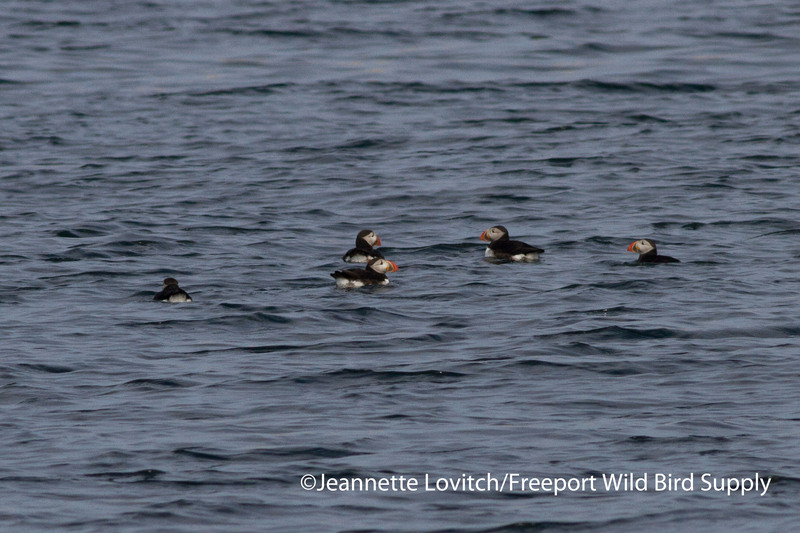 A total of 19 Northern Gannets were counted, and Razorbills (9), 2 Common Murres, and more Atlantic Puffins (4+) added to the show. 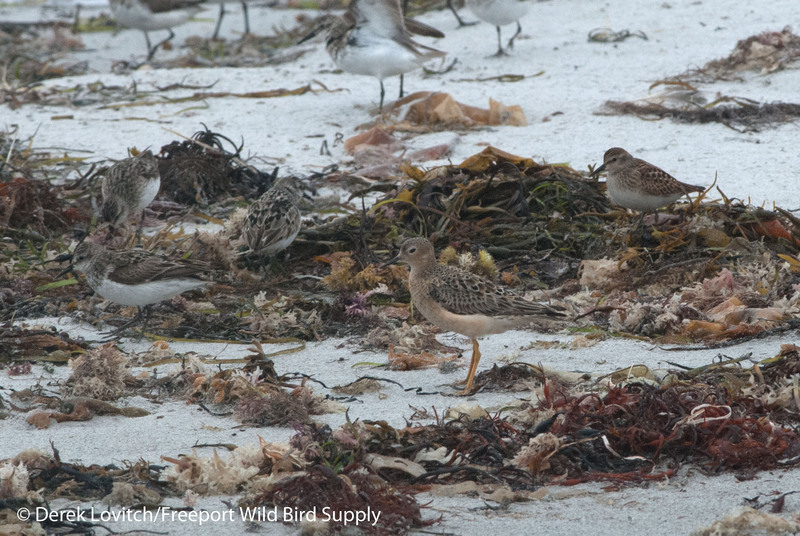 Although overshadowed by the rafts of shearwaters, Red-necked Phalaropes were in abundance – I estimated at least 400 birds, most of which in tight flocks spinning in floating mats of wrack. 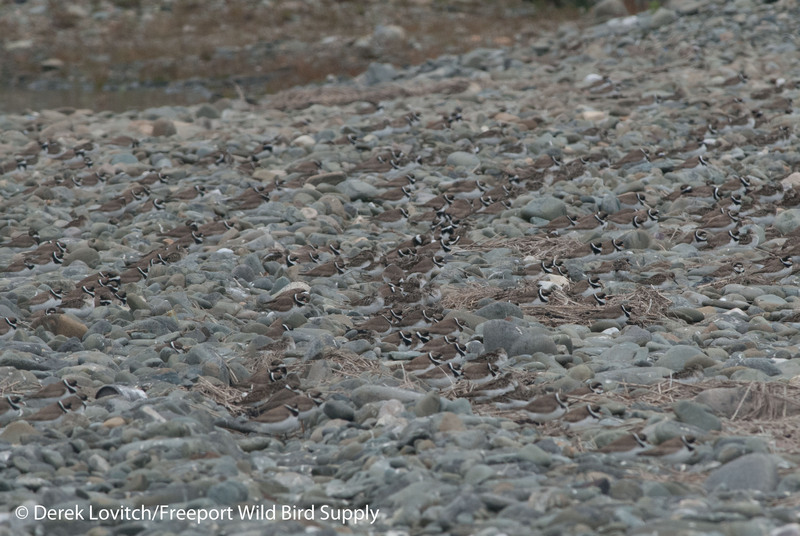 I didn’t pull out any Red Phalaropes from the bunches, but it wouldn’t have surprised me to find some mixed in. 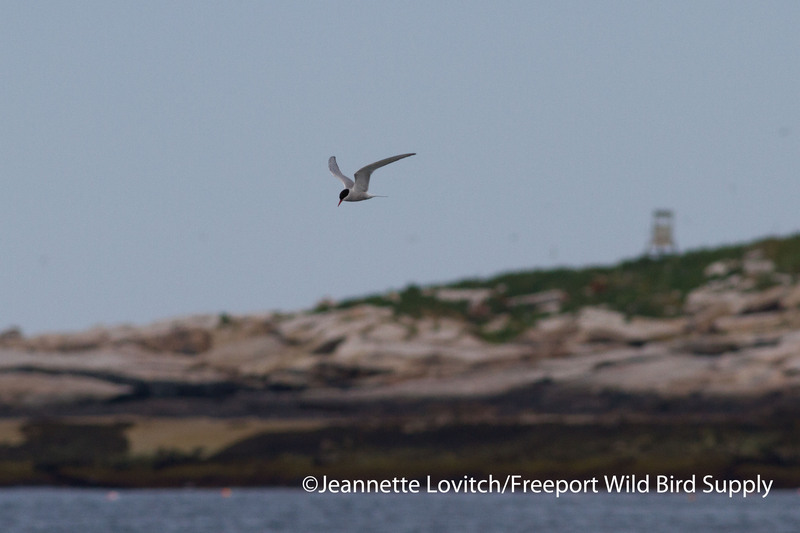 Surprisingly, not a single Wilson’s Storm-Petrel was seen – a bird that we somehow didn’t even see all trip! Where the heck are they this year? It’s usually the most common tubenose on our tour! If we didn’t have some important plans for dinner, we would have spent more time out here I am sure, as this was really a great experience. 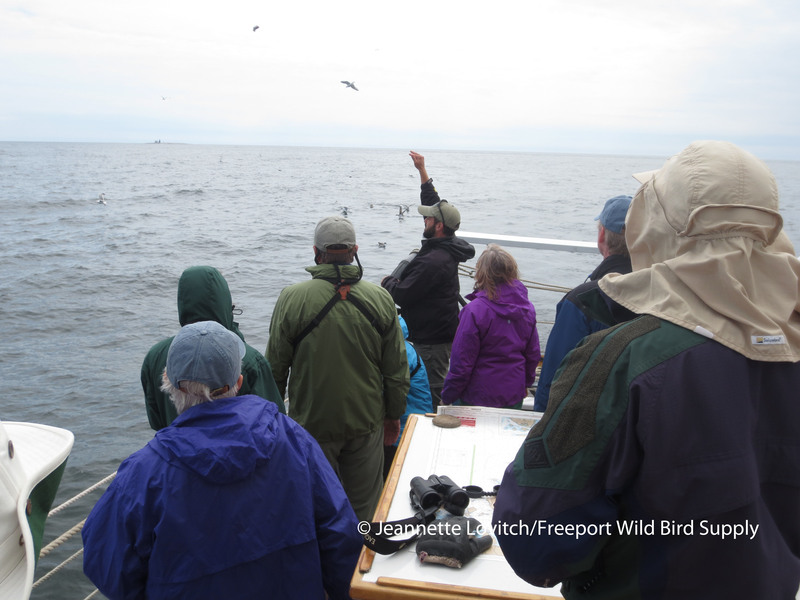 Even the non-birders aboard were more than impressed by the show. 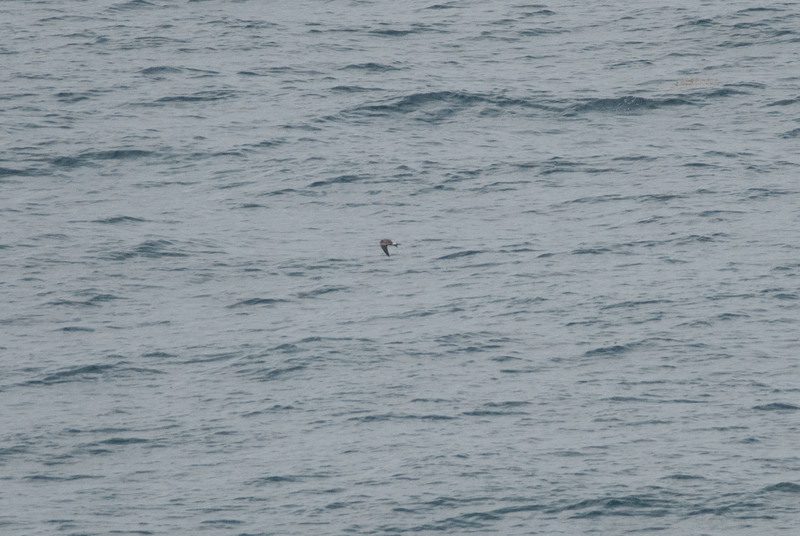 Unfortunately, only one Fin Whale was briefly spotted. 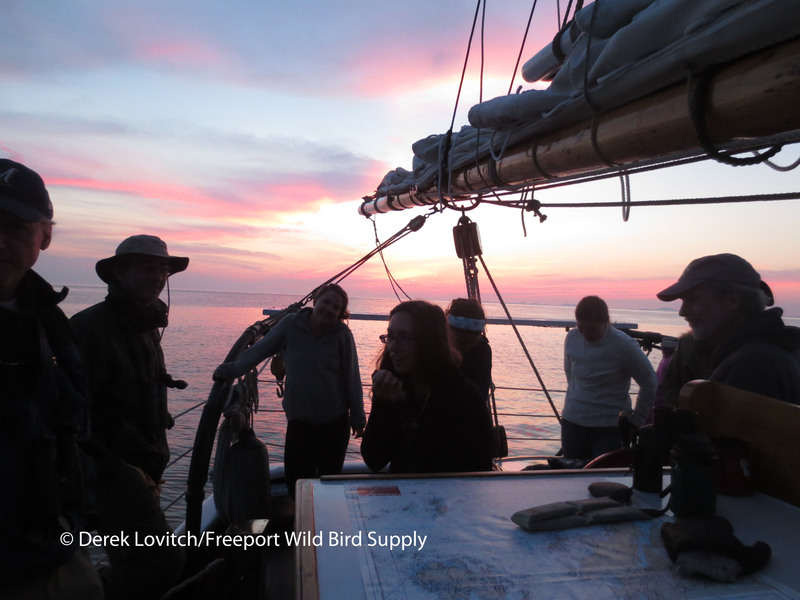 A feeding frenzy of birds that I spotted in the distance were clearly excited by something feeding – either whales or perhaps tuna, but by the time we made it to the area, the birds had settled into the massive rafts we sailed through. 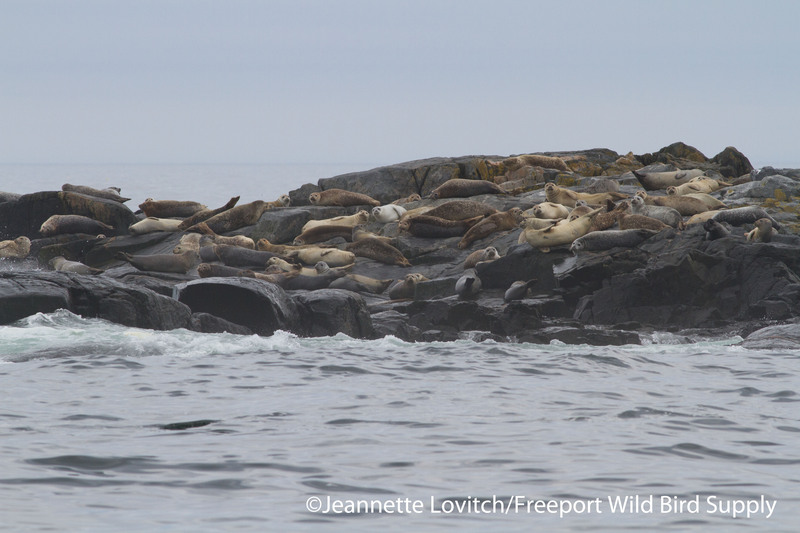 We skimmed the mouth of BlueHillBay, checking our Harbor Seals basking on ledges exposed by the low tide, and happening upon a few large rafts of molting Common Eiders. 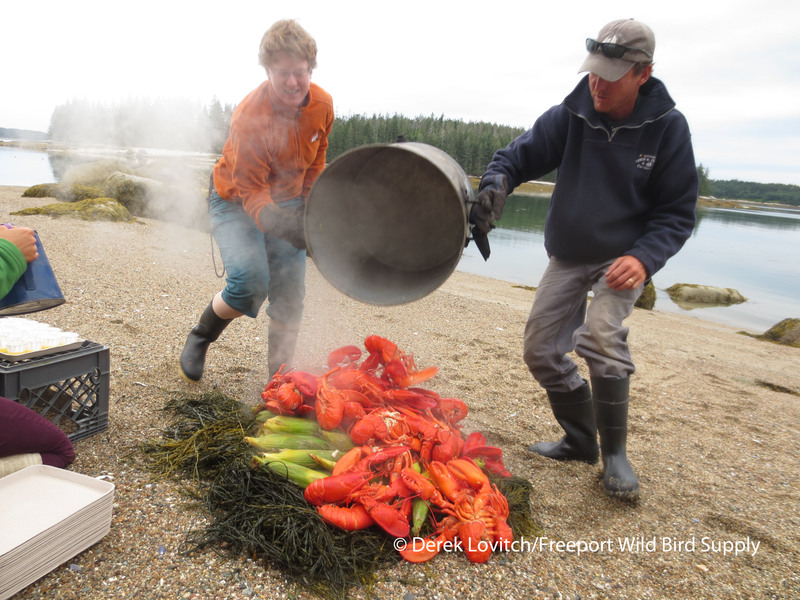 We dropped anchor off of McGlatheryIsland south of Stonington, and rowed ashore for one of the non-birding highlights of the trip – a lobster bake on the beach! 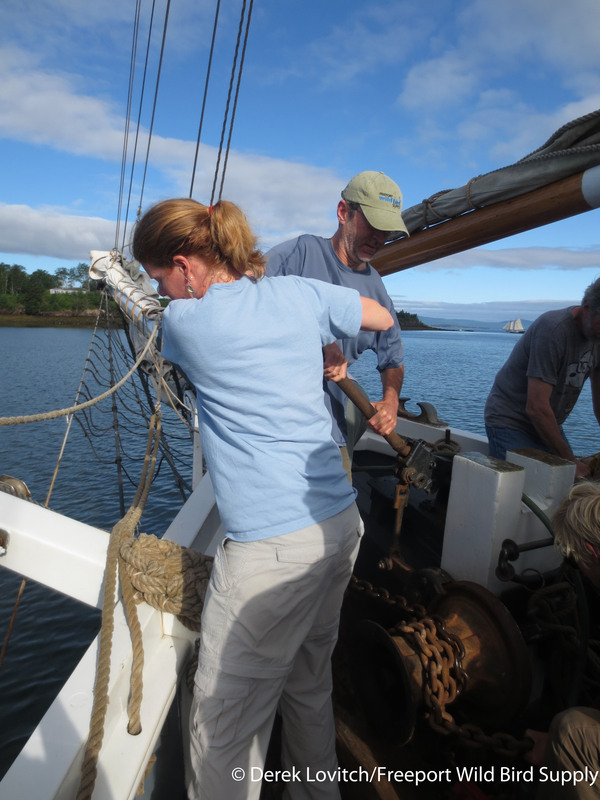 After the feast, we moved the boat to a safer anchorage off of Hell’s Half-Acre, where we spent the night. Rain fell in buckets, and continued on and off through much of the next day. 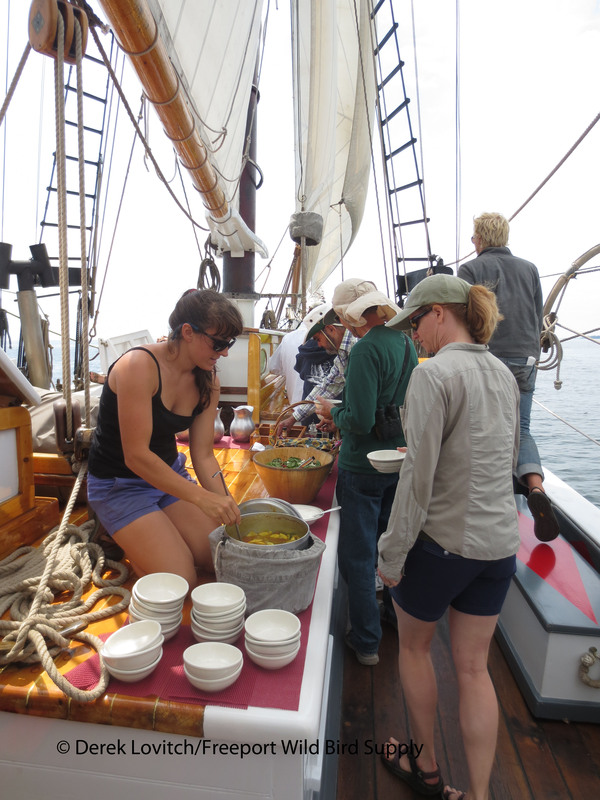 However, for the first time, we had some solid winds to do some real sailing, and after donning our rain gear, many of us stayed on deck for much of the day as we crossed East Penobscot Bay and tacked our way around North Haven. Slowly but surely, however, most of us made our way to the wood-burning-stove-warmed galley for snacks, tea, and conversation…and a few games. 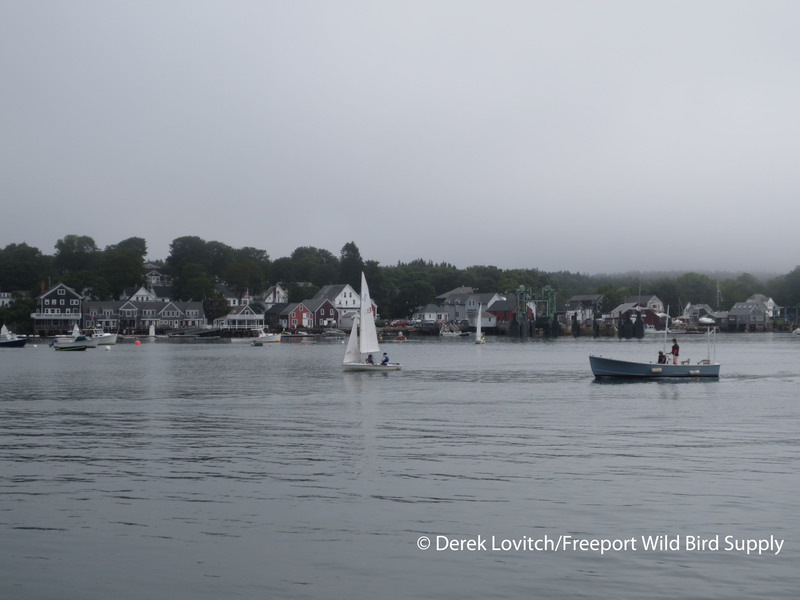 The rain cleared and fog lifted in the afternoon, and it was a lovely evening in the shelter of Pulpit Harbor. 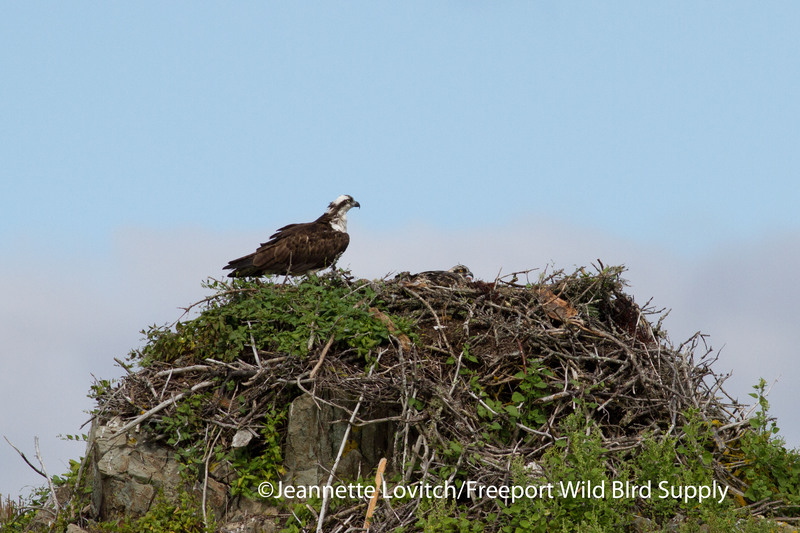 Although we had seen plenty of Ospreys on this trip, the Ospreys that nest atop the rock (the “pulpit”) that guards the entrance to the harbor are particularly noteworthy – the explorer and cartographer Samuel de Champlain noted an Osprey nest atop this very rock sometime between 1604 and 1607! 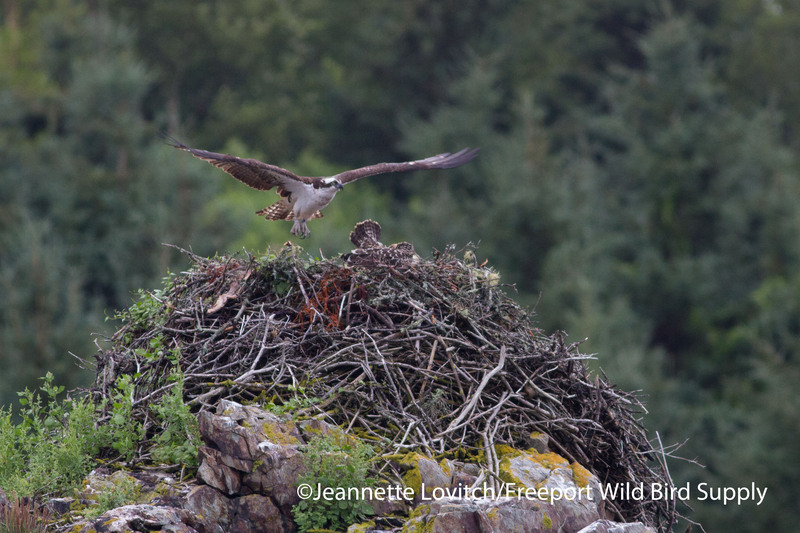 The one still-present juvenile that was being watched by an adult had no idea what a historic nest it was raised in. 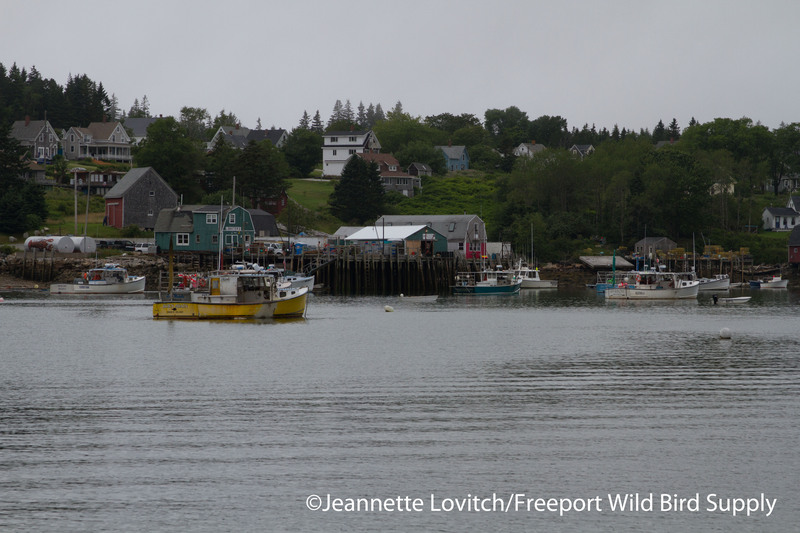 July 27th, our 6th and final day of the tour, dawned on Pulpit Harbor under clearing skies, calm winds (again), and warmer temperatures. 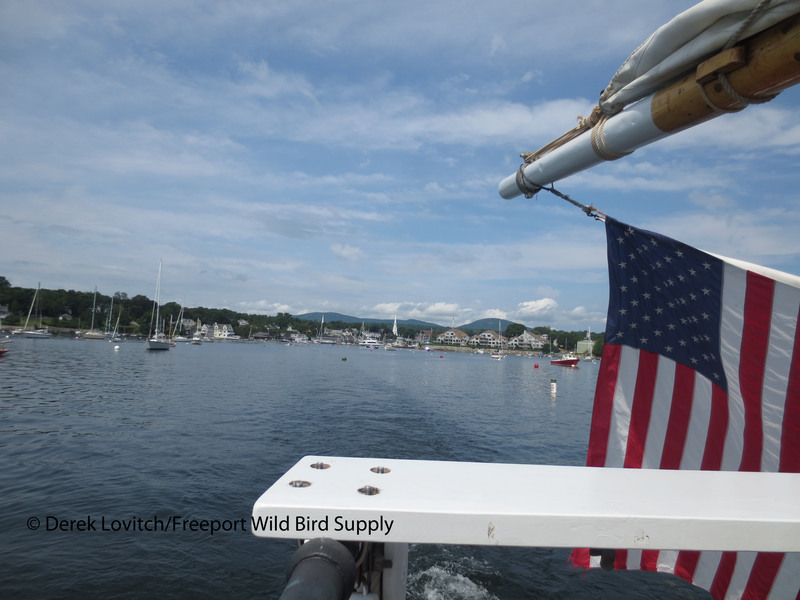 Barn Swallow, likely a migrant, was added to our trip list as we sailed northeast into Camden Harbor. 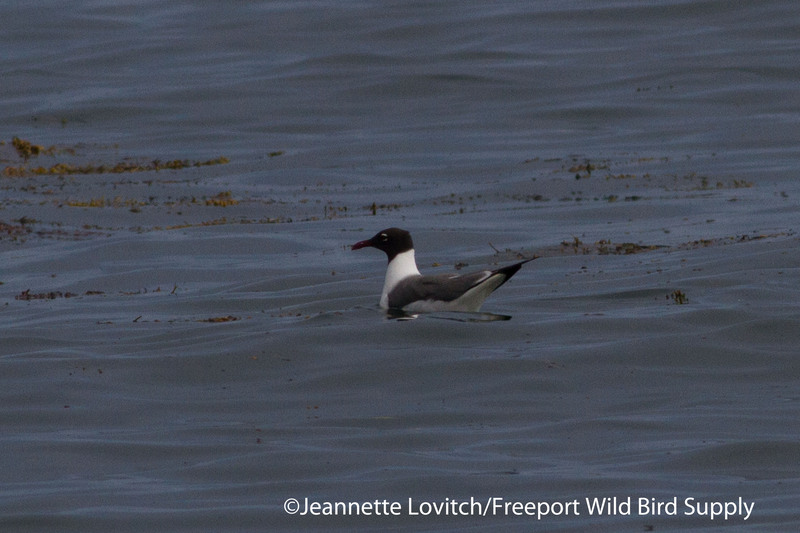 Chimney Swifts overhead and a singing Yellow Harbor from the shoreline were our 82nd and 83rd – and final – species of the trip (an “accounting error” led to a mistaken tally of 78 species announced at the end of the trip; sorry folks, update your notes!) but still a tally held down a little by fewer walks ashore (one due to our deep-water pelagic, and the other due to heavy rain). 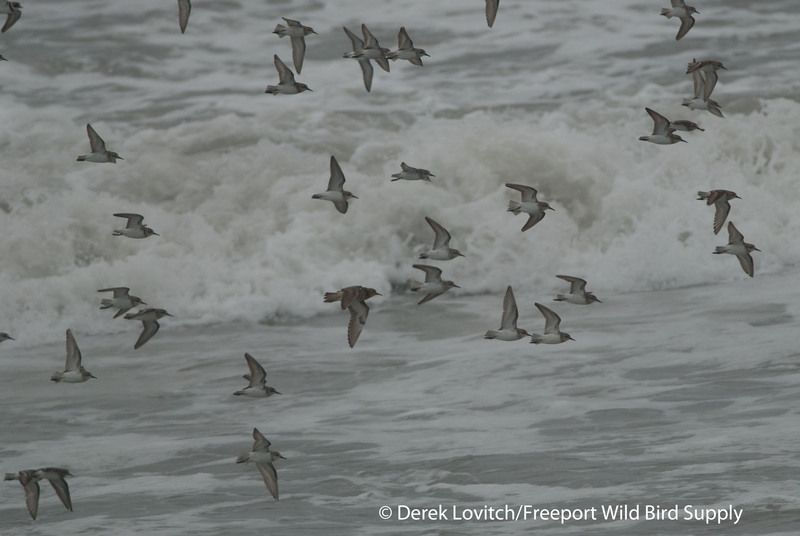 However, our seabird list was fantastic, and quite a few of the birders added life birds – the Leach’s Storm-Petrels and Manx Shearwaters in particular. And perhaps, sucked in by the fun of it all, one or two life lists were born. 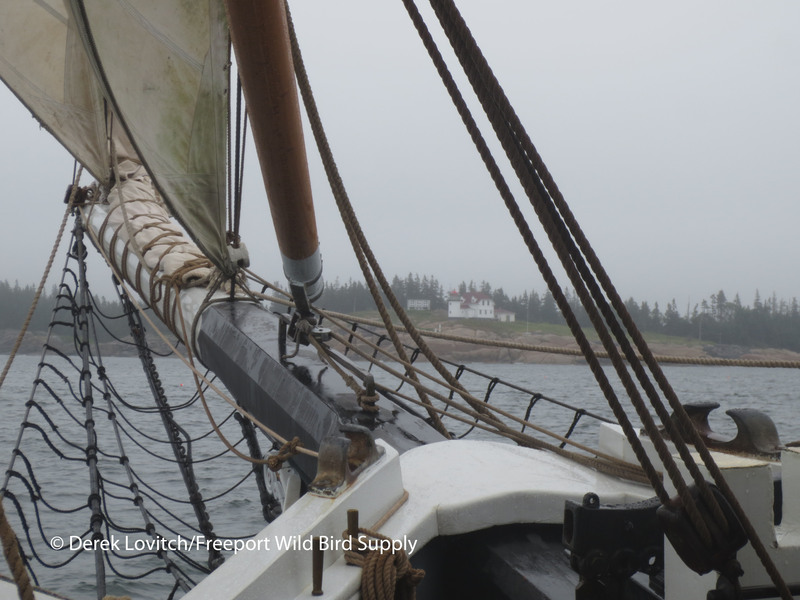 Our “Birding By Schooner” Tour aboard the Lewis R. French has been run every three years. 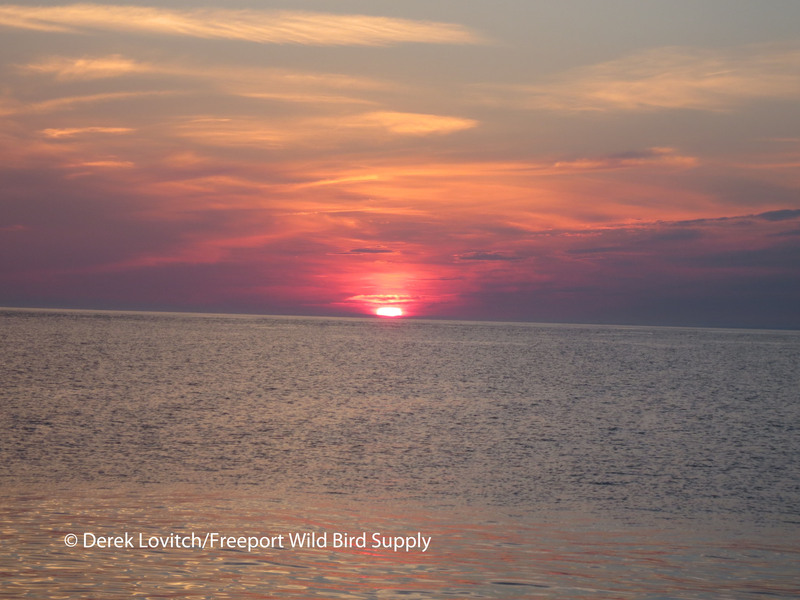 However, thanks to increasing interest and demand, we are going to likely be offering this one-of-a-kind birding experience on an annual basis! 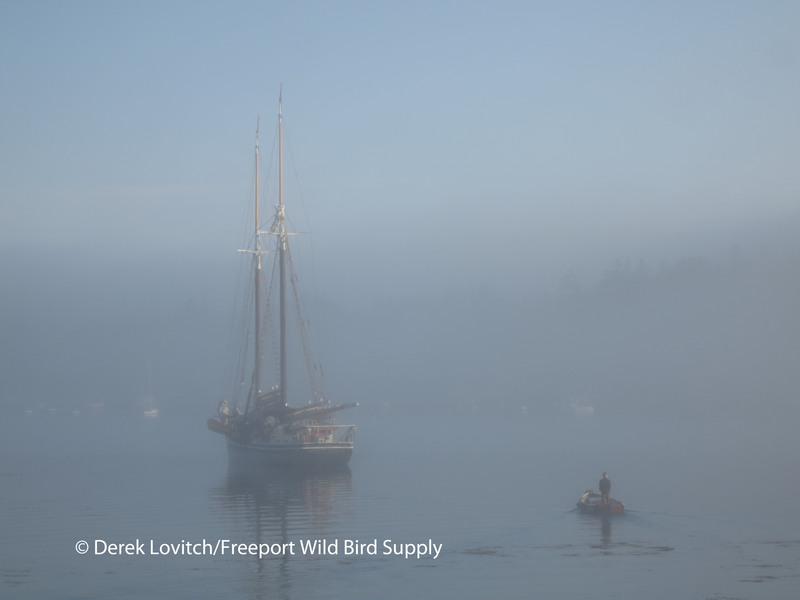 Keep an eye on our “Travel, Tours, and Workshops” page at http://www.freeportwildbirdsupply.com/birdingtoursinMaine.asp for information about the possible 2014 (but likely definitely in 2015) sailing dates. 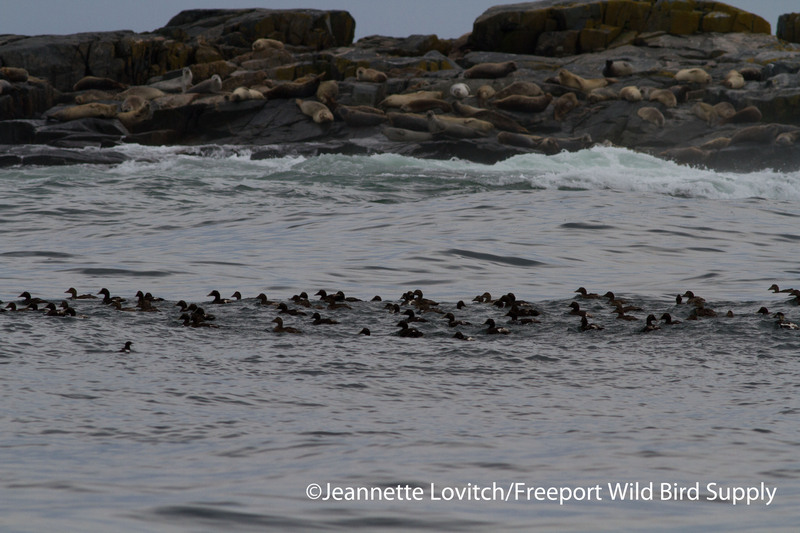 This entry was posted in Private Guiding and Tours and tagged Arctic Tern, Atlantic Puffin, Birding, Black Guillemot, Camden, Great Shearwater, green pelagic, Maine, Mount Desert Rock, Northern Gannet, pelagics, Razorbill, Schooner Lewis R. French, Seal Island, Sooty Shearwater on July 29, 2013 by Derek.